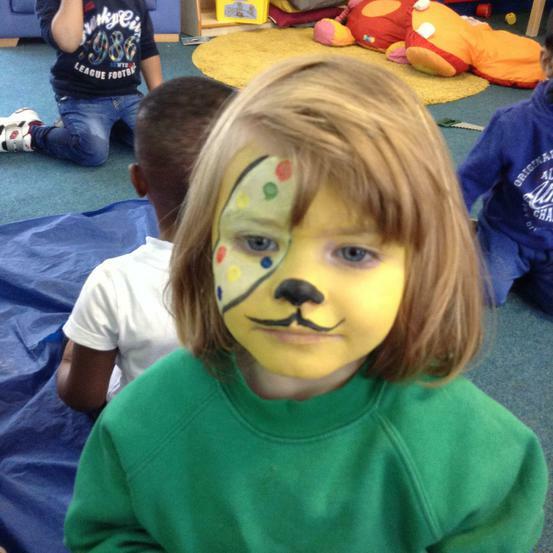 Please remember to bring your child's library book back to school on a Friday so that they can swap it for a new one. 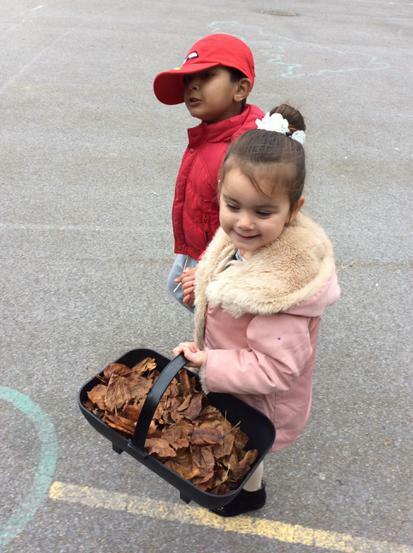 We visit the library every week. 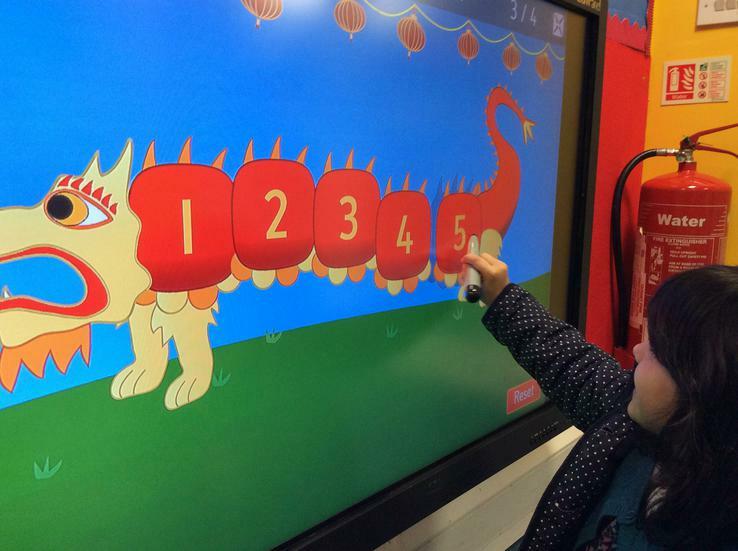 Your child's progress in school is recorded on an online learning journey (Tapestry) which you can access at home. 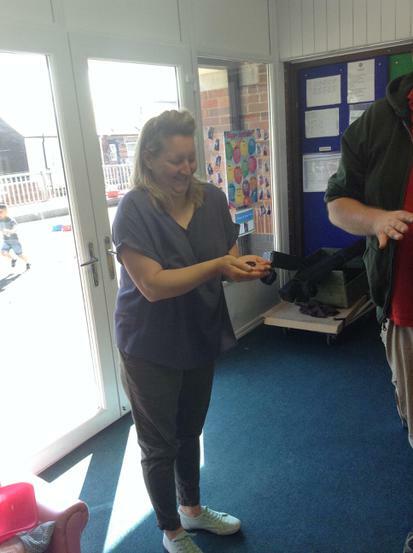 Please make sure that you have given Mrs Jagger your email address so she can activate your account. 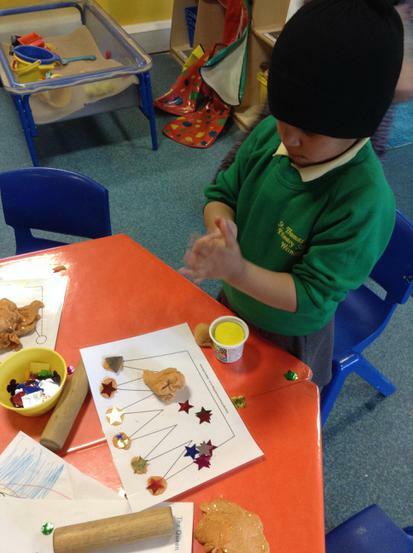 During this half term we are exploring the topic 'Teddy Bears'. 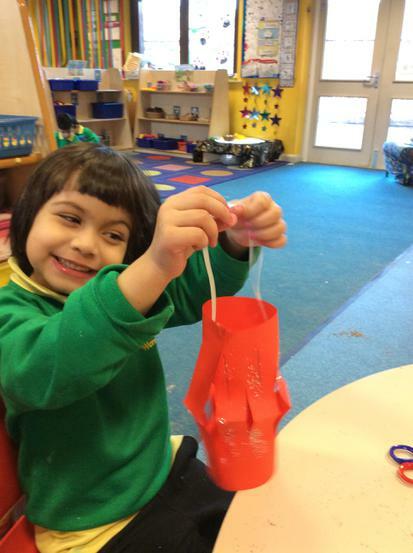 Take a look at our topic web to find out all the exciting things that we will be learning about! 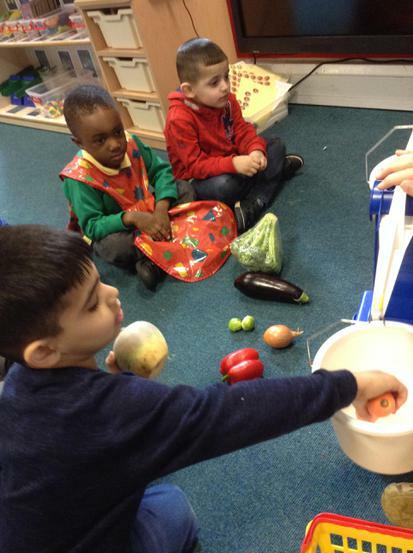 This half term we are exploring the topic of 'Food'. 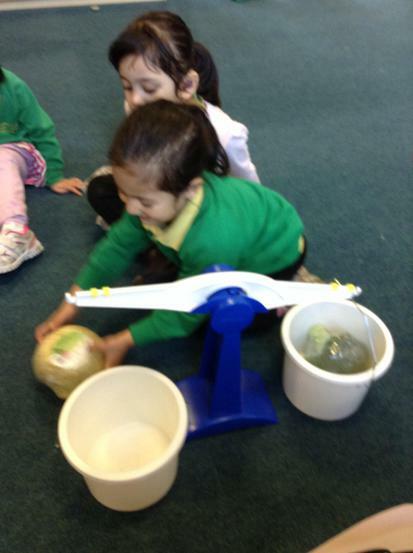 See the topic web below to find out all the wonderful things that we will be learning about. 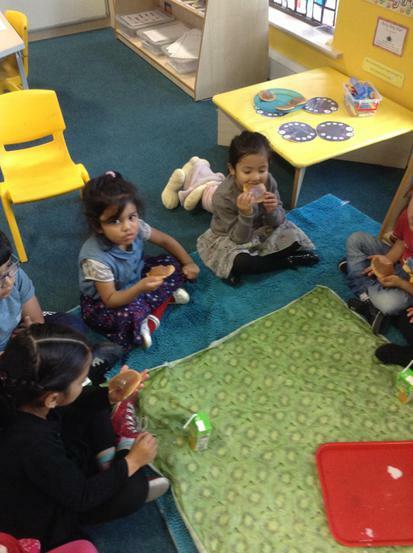 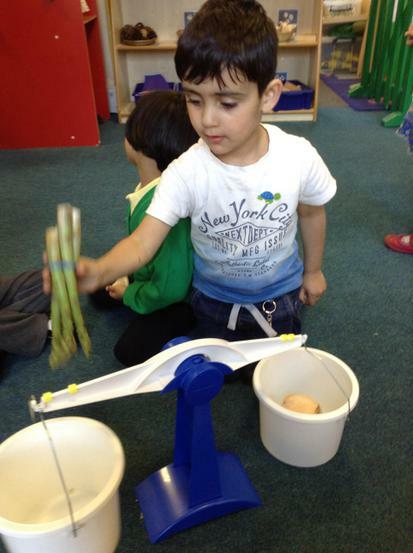 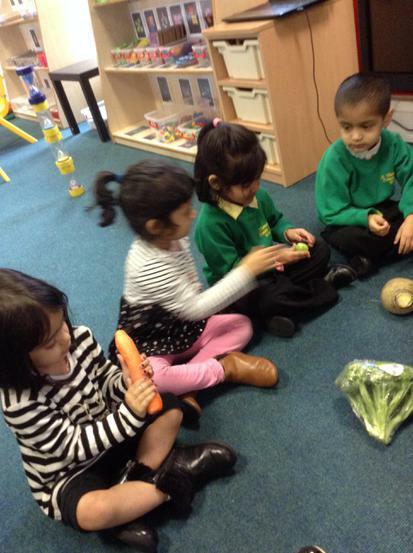 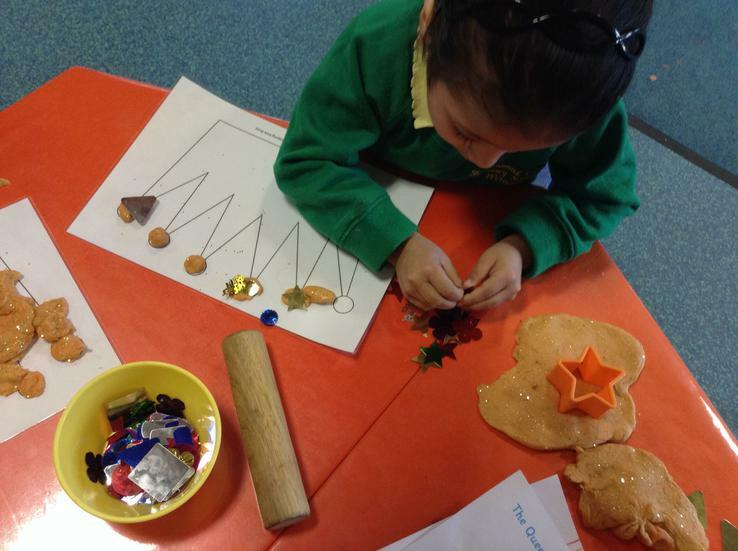 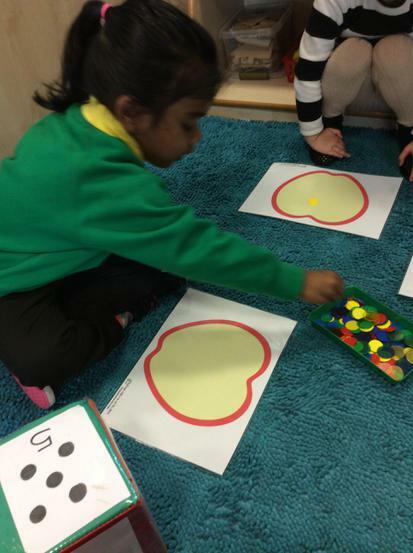 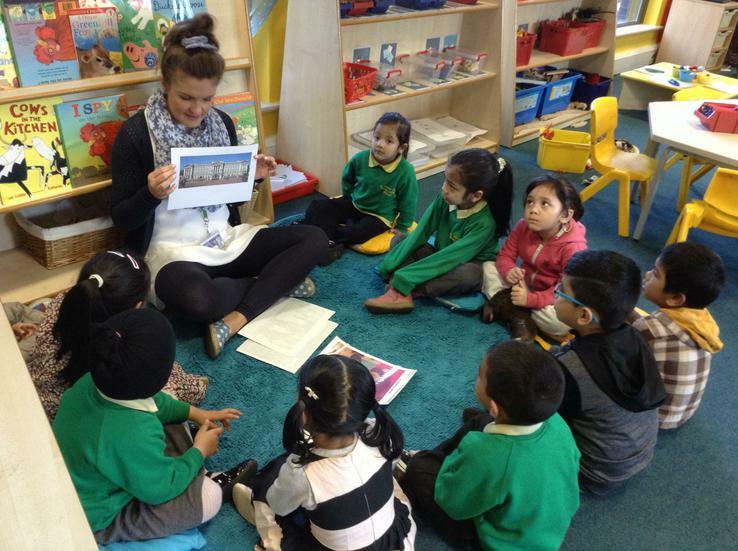 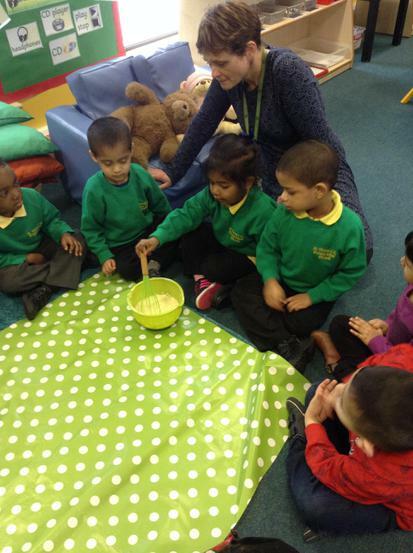 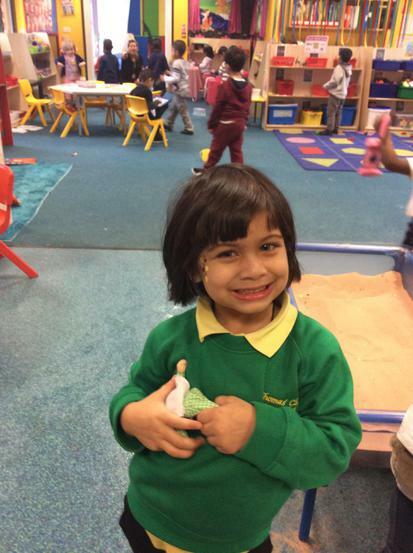 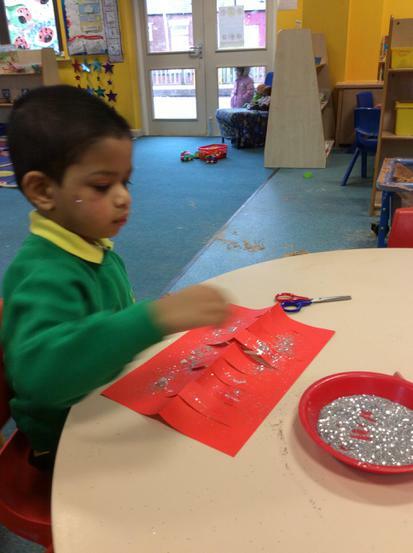 Oliver's Vegetables- Nursery have been reading the story Oliver's Vegetables. 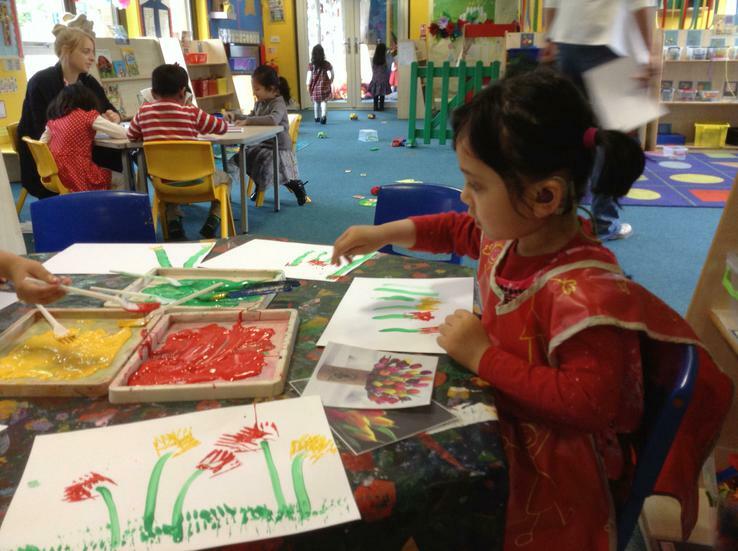 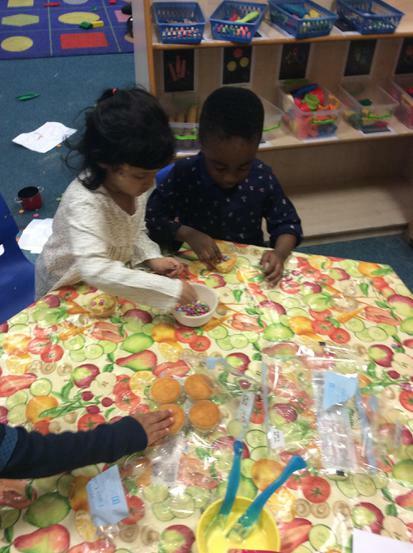 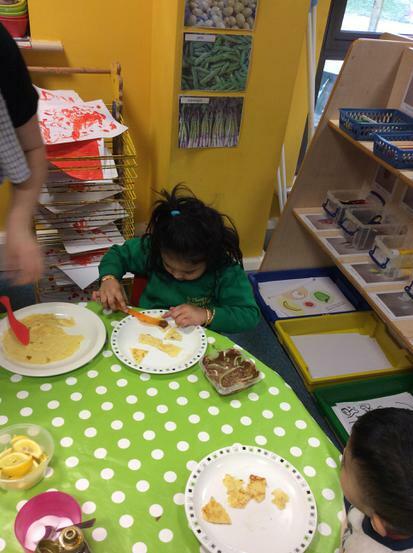 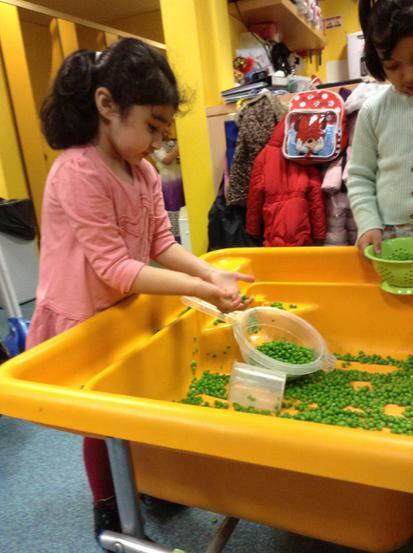 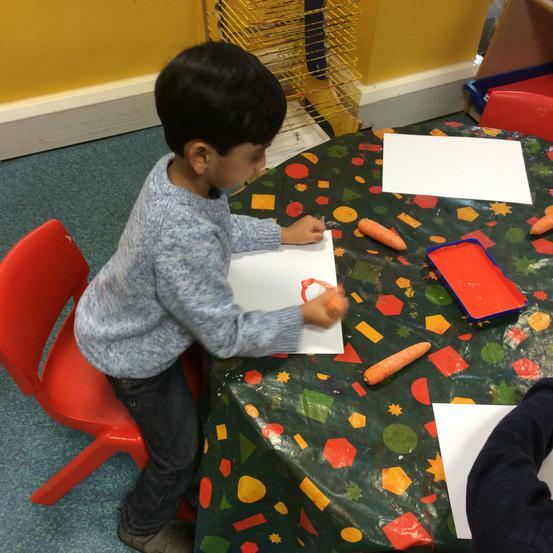 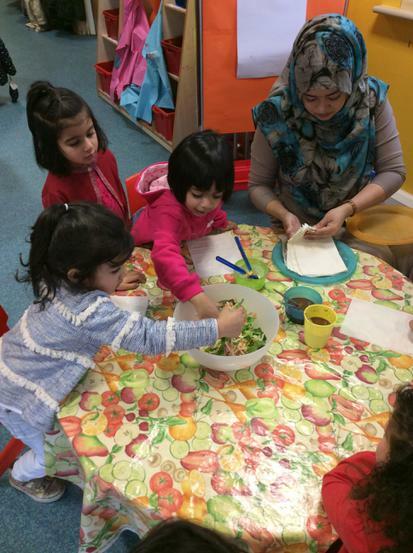 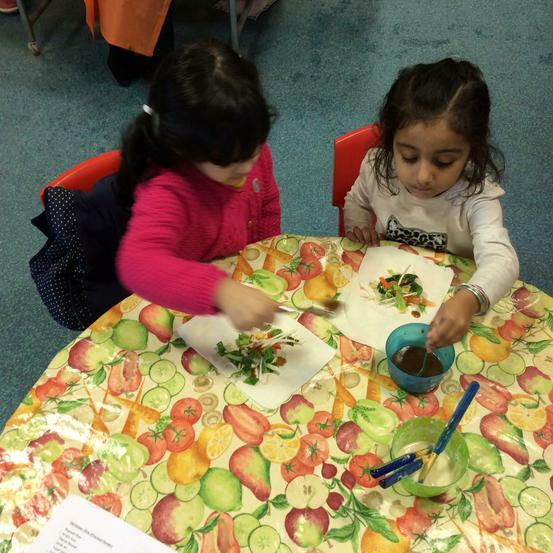 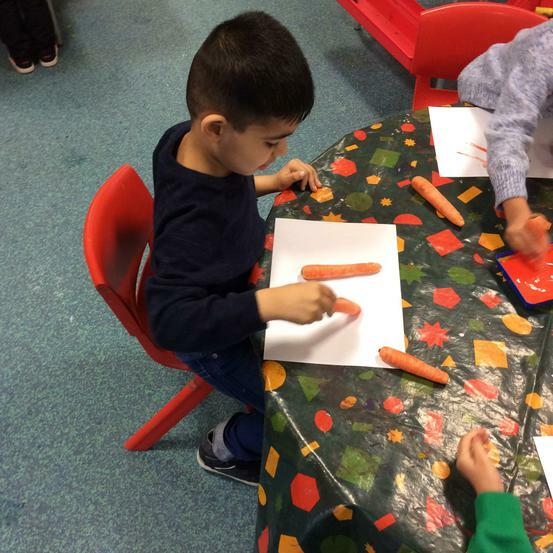 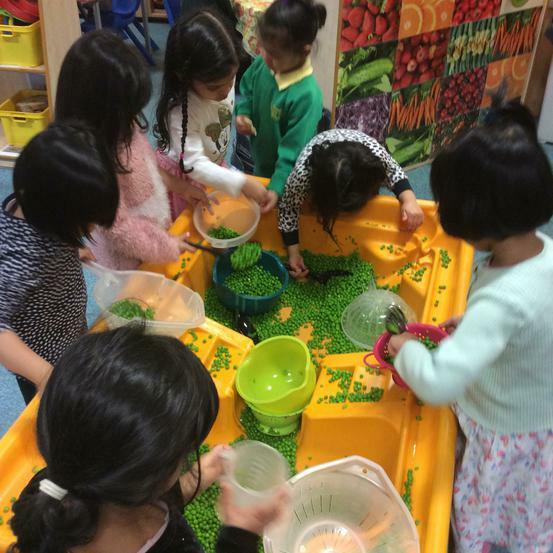 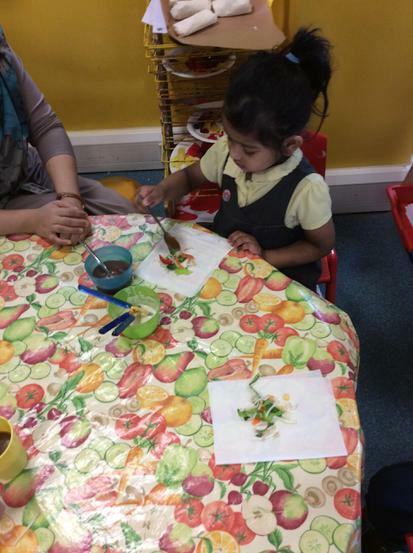 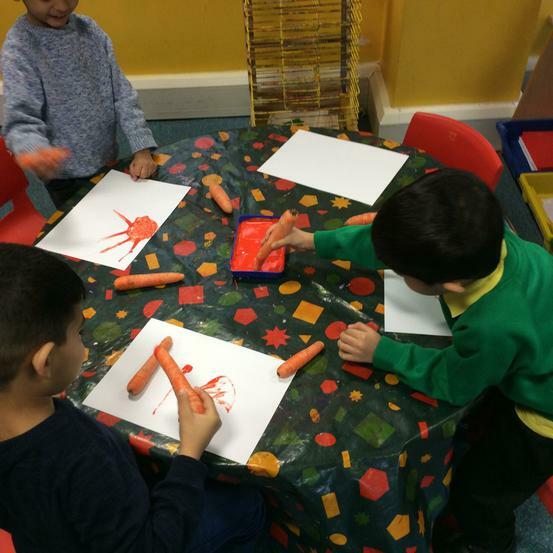 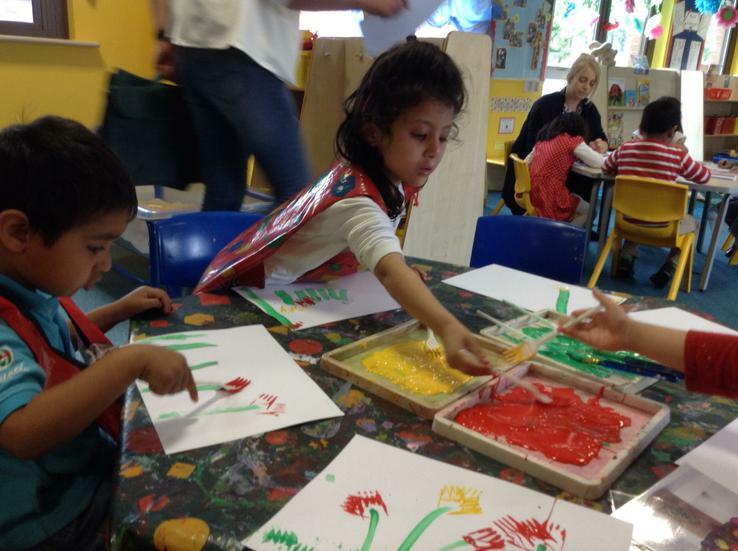 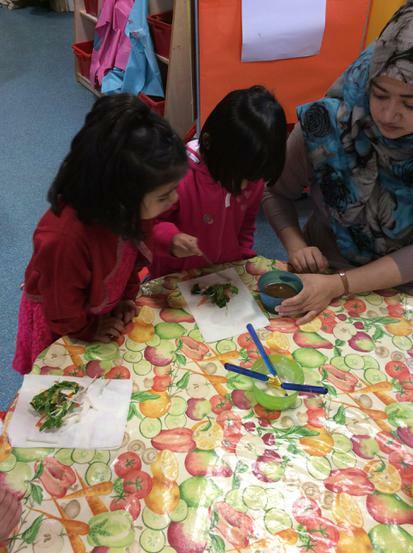 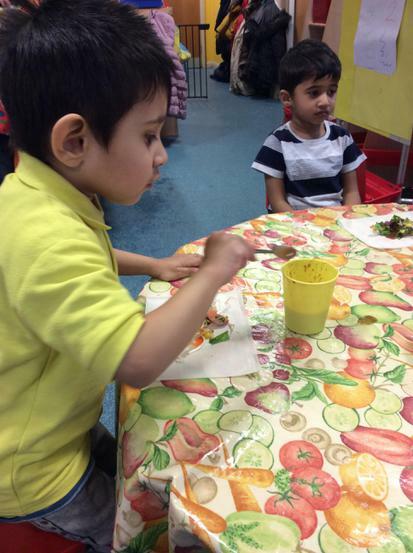 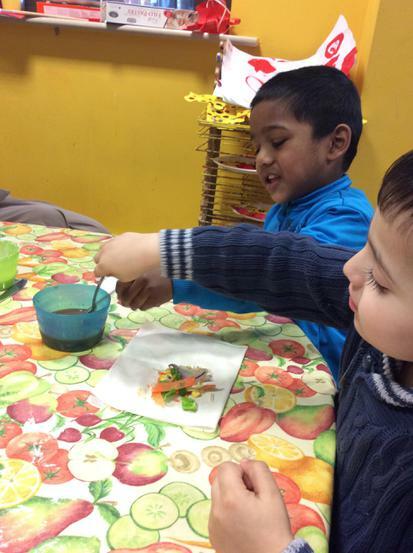 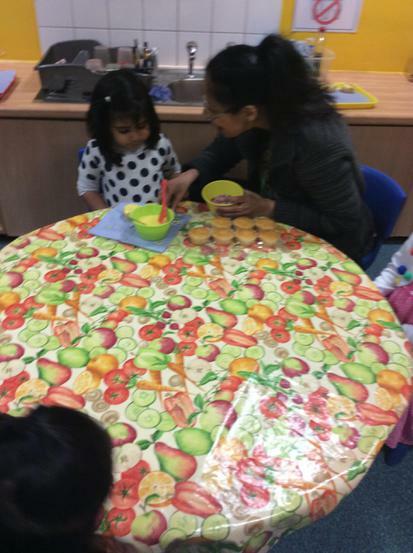 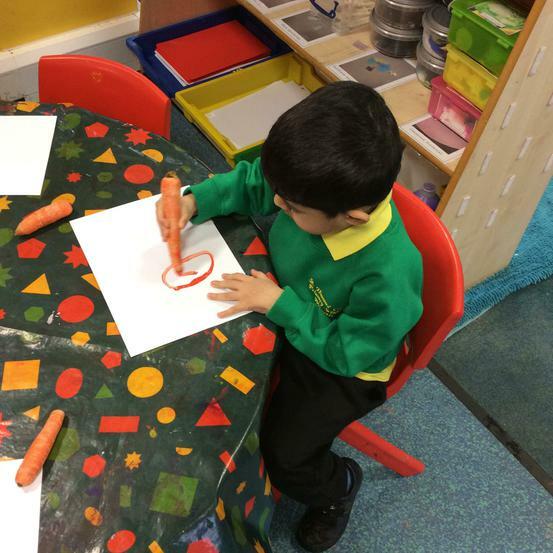 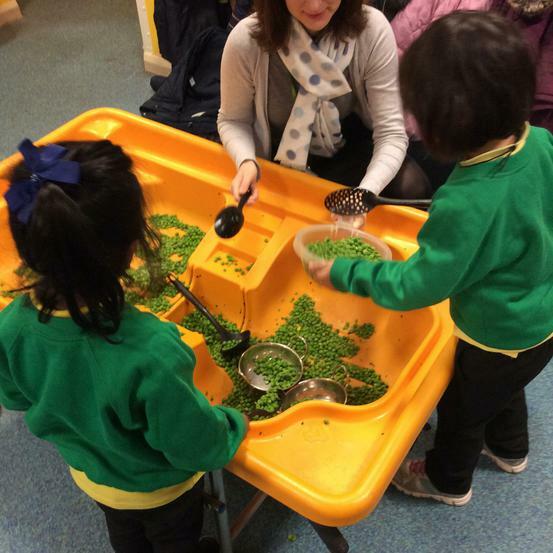 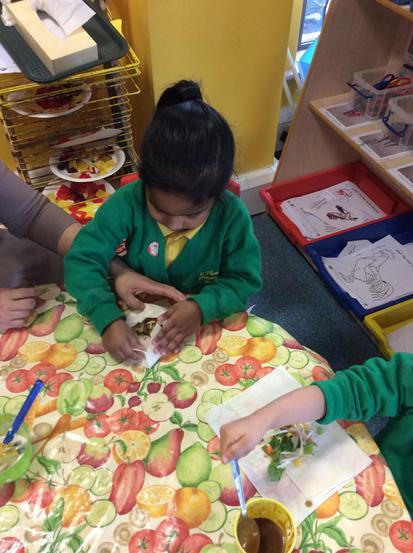 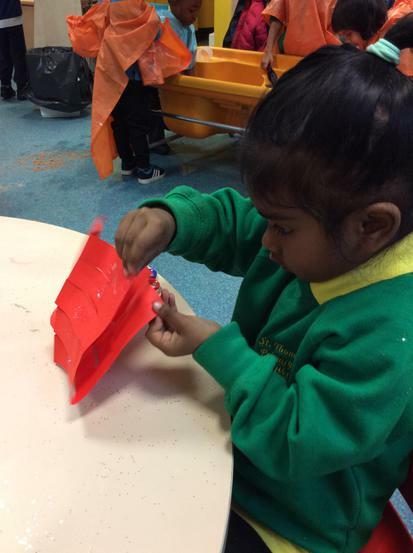 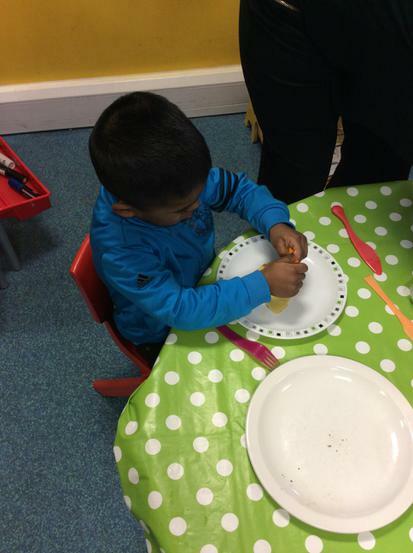 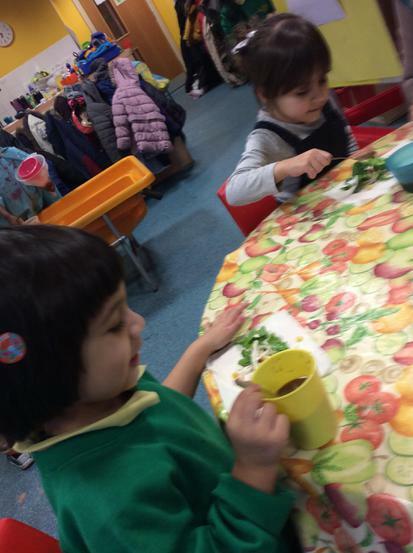 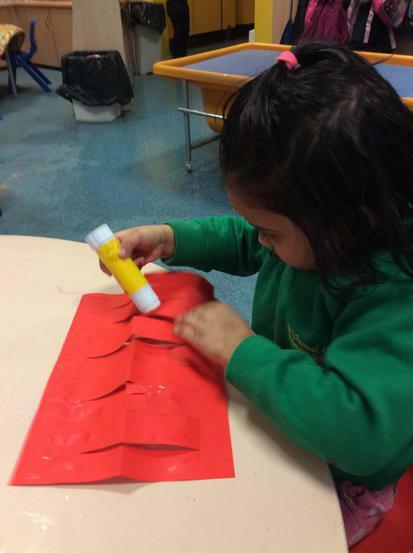 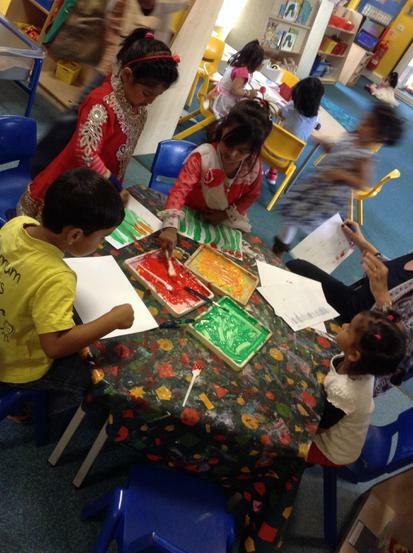 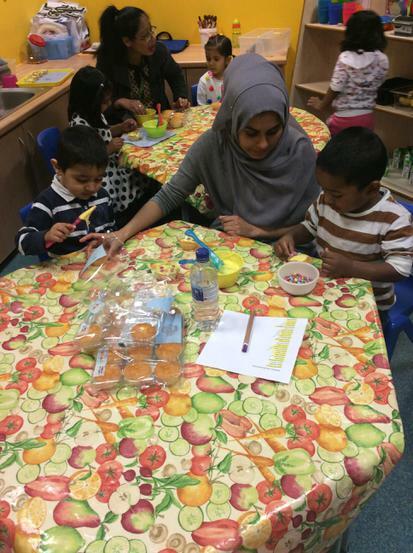 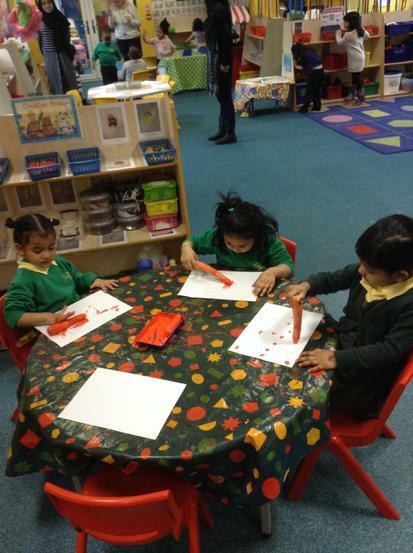 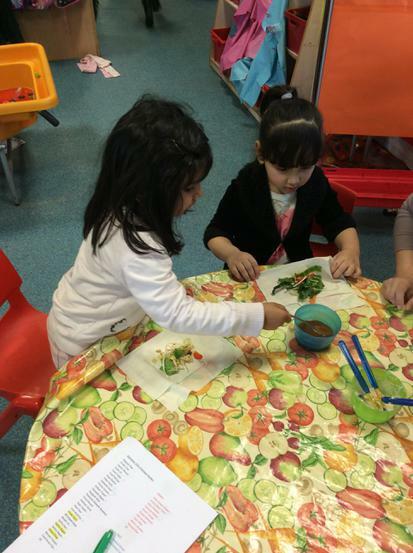 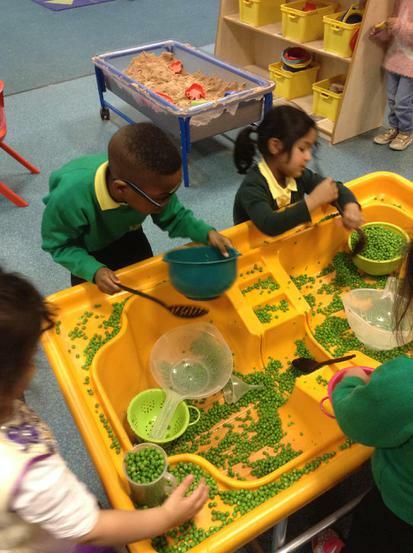 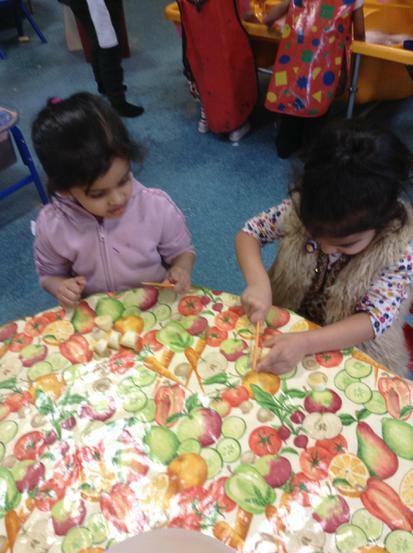 The children had fun painting with carrots, printing with vegetables, scooping and pouring peas in the water tray and weighing a variety of vegetables. 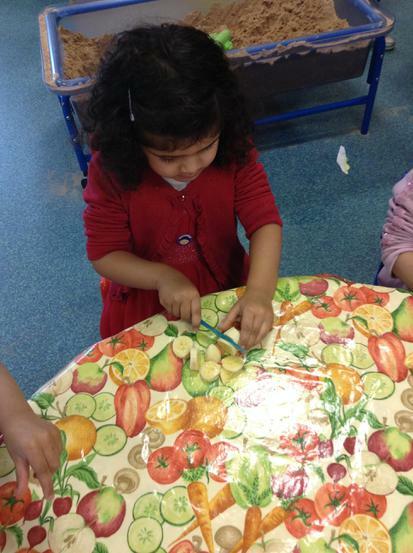 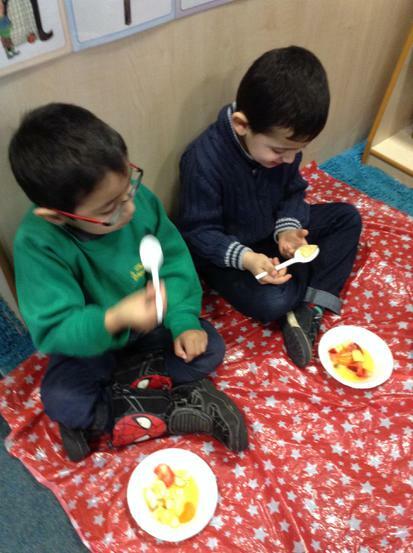 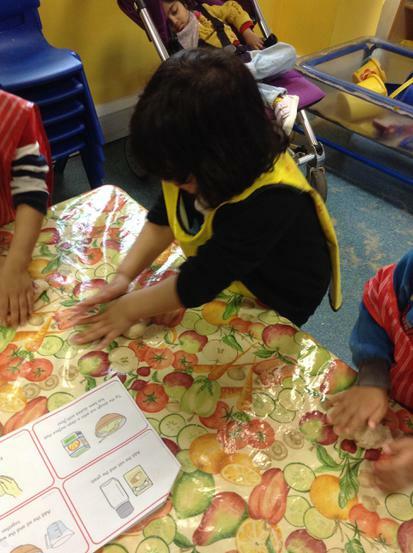 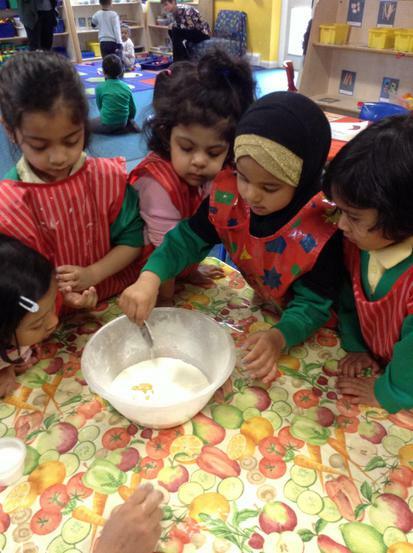 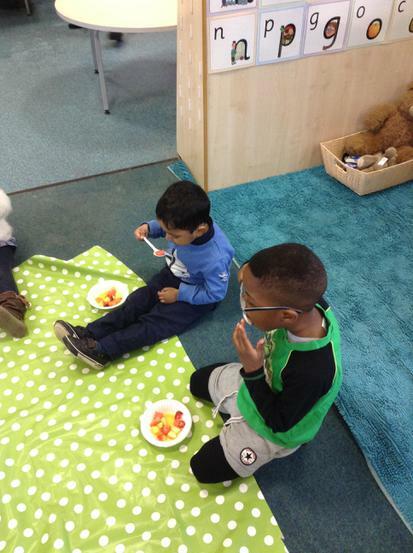 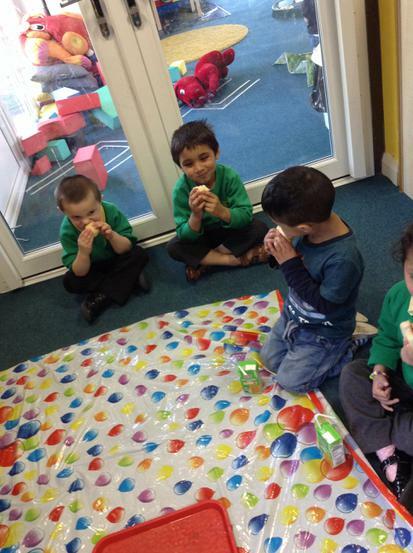 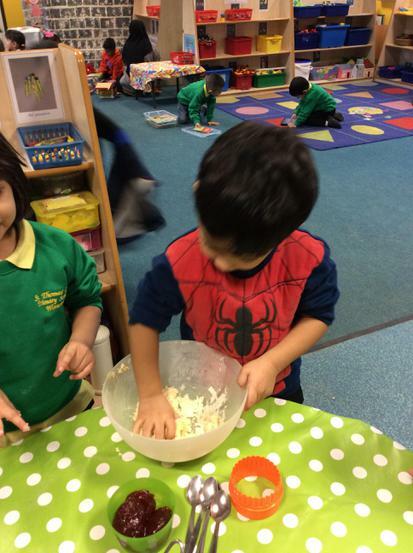 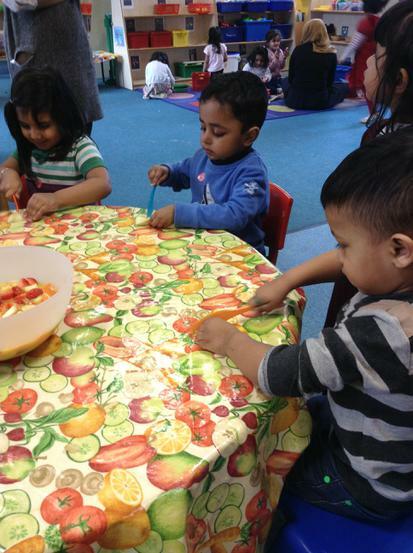 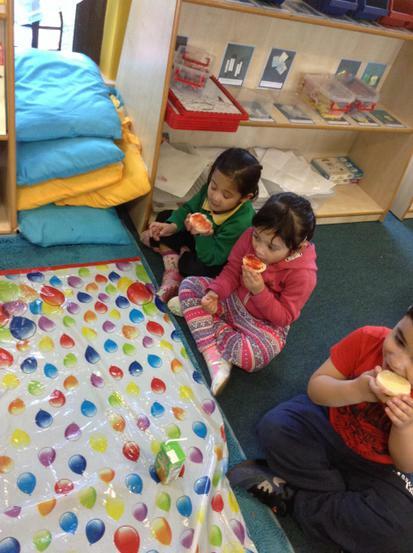 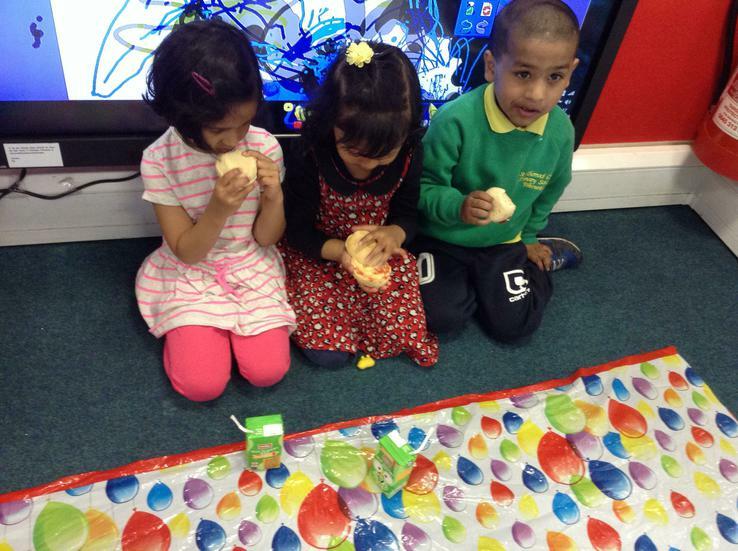 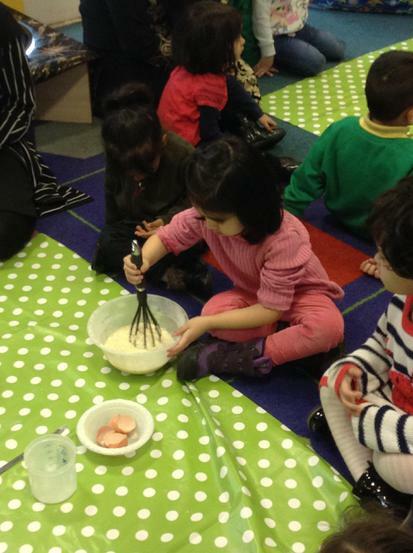 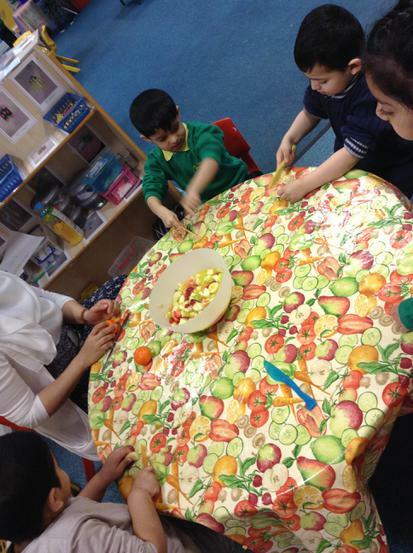 Oliver's Fruit Salad- As part of our food topic, Nursery read the story Oliver's fruit salad. 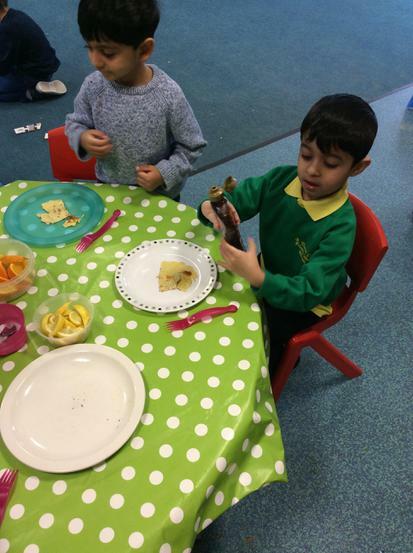 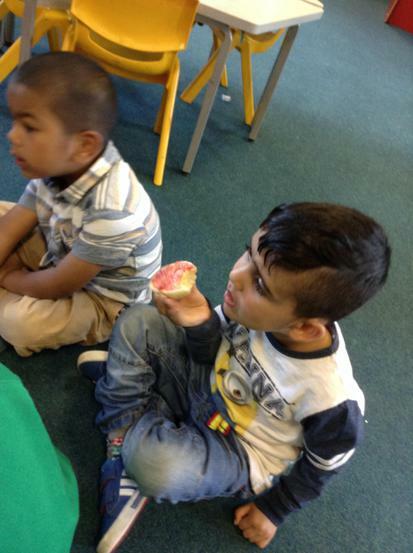 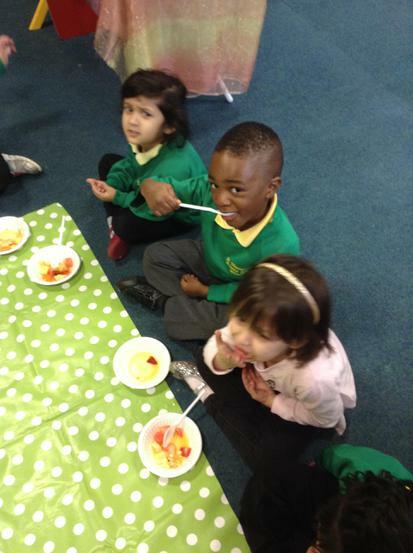 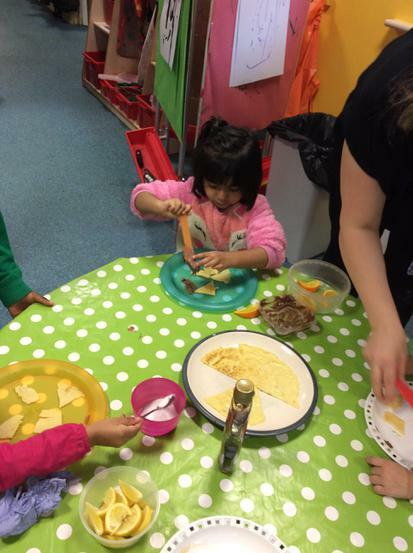 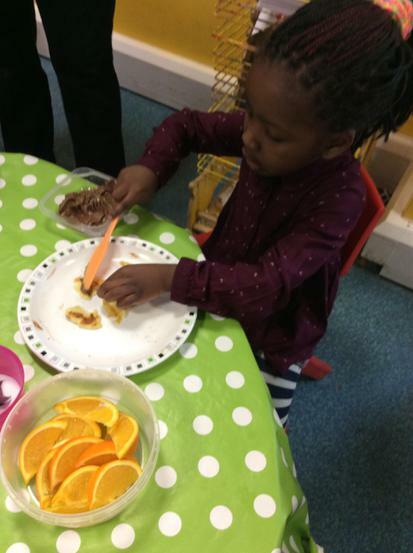 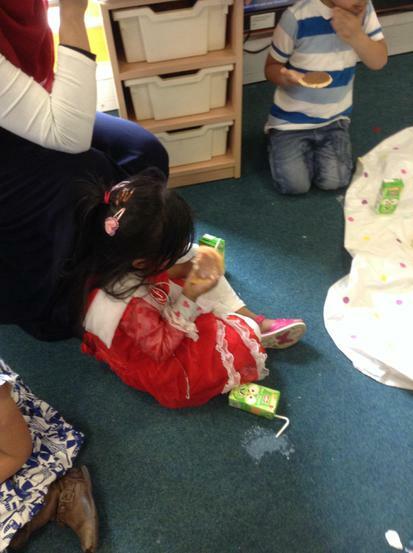 The children made their own fruit salad as well as taking part in lots of activities linked to fruit. 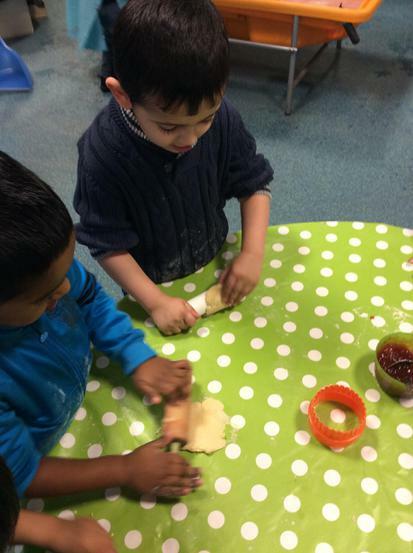 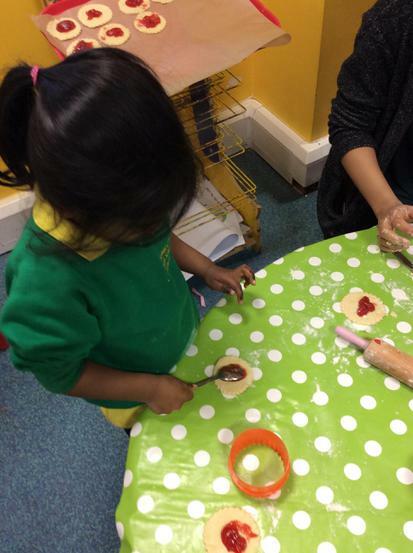 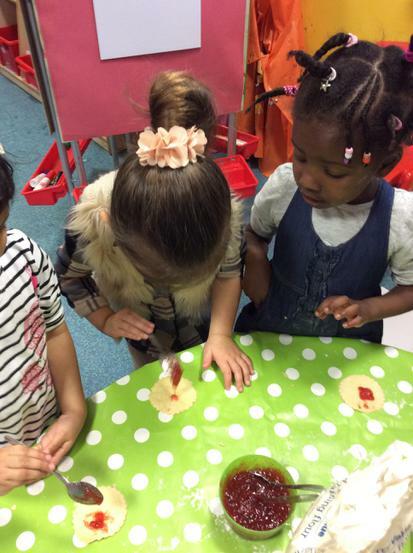 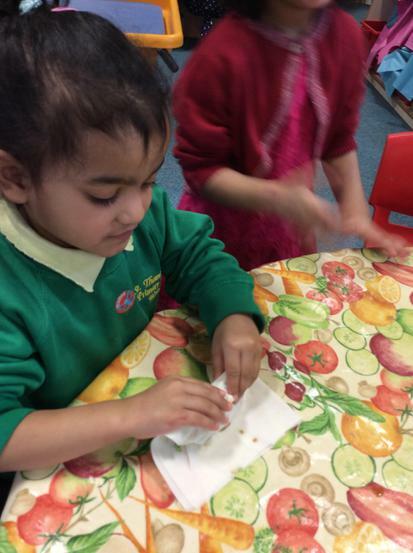 Jam Tarts- The children have great fun making jam tarts and even more fun eating them!!! 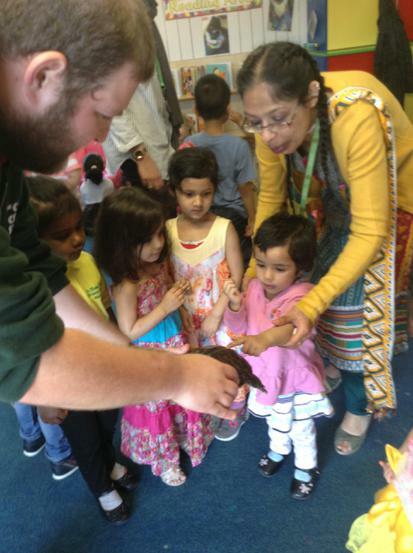 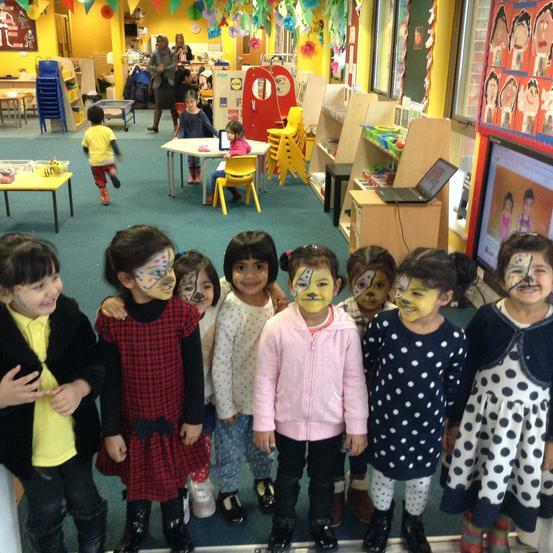 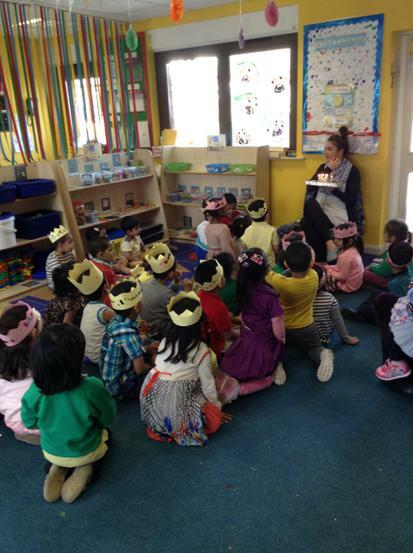 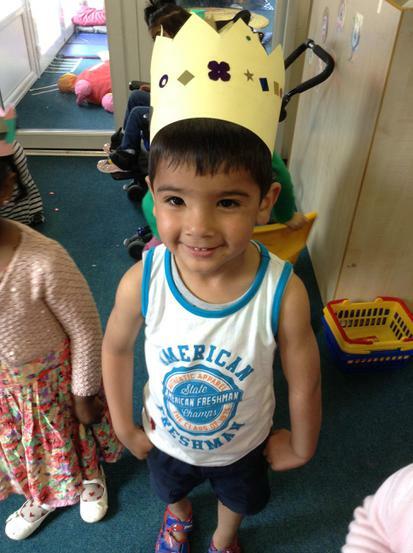 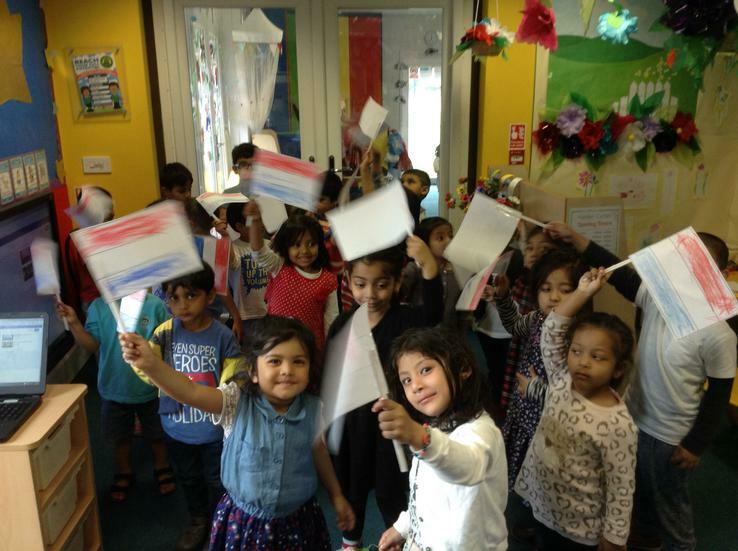 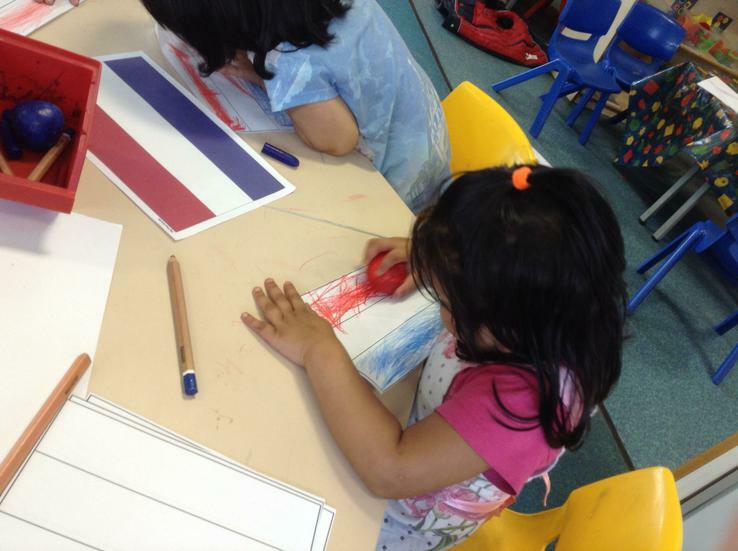 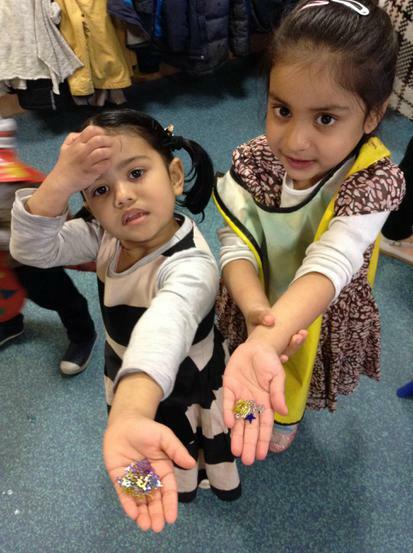 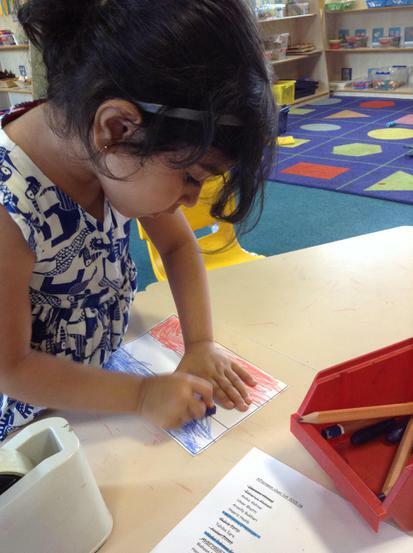 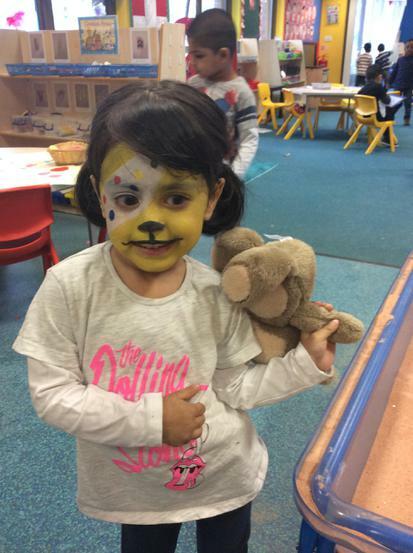 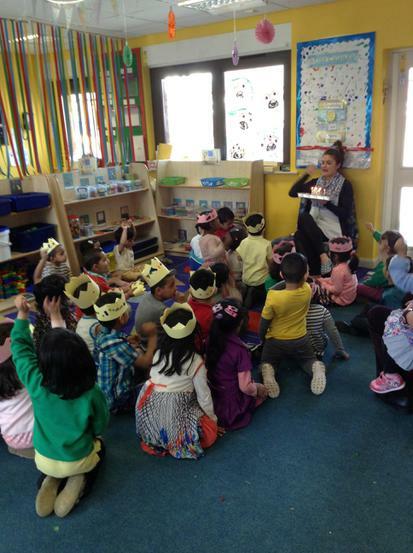 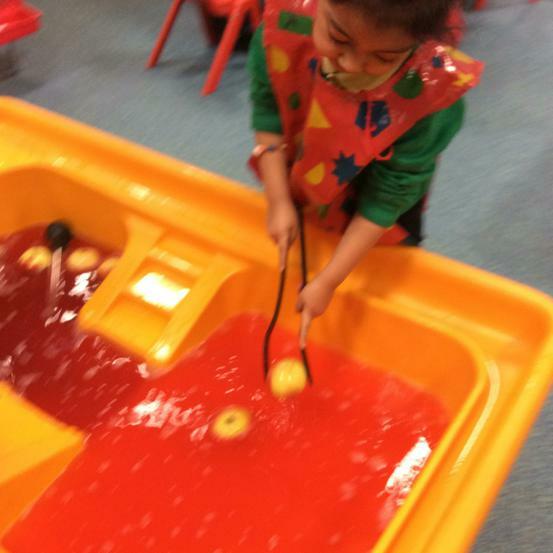 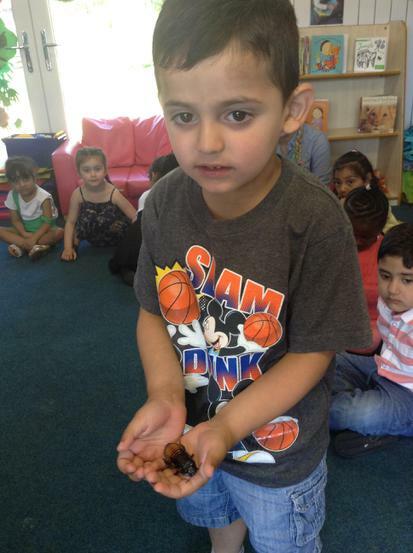 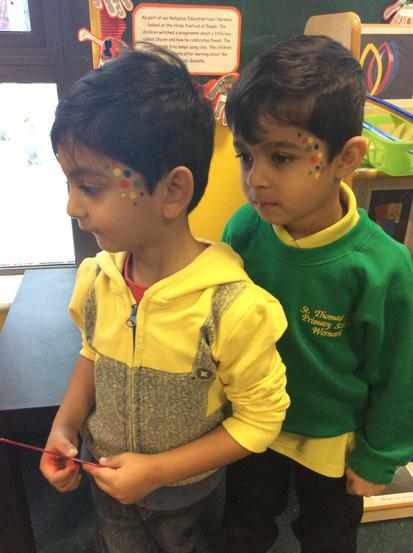 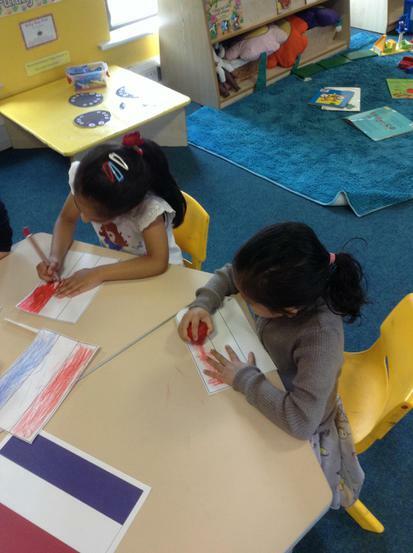 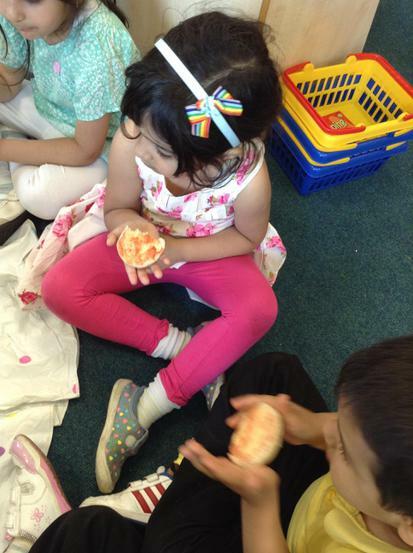 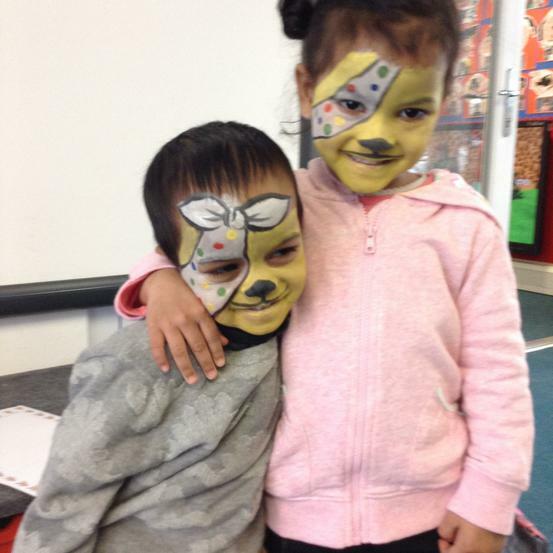 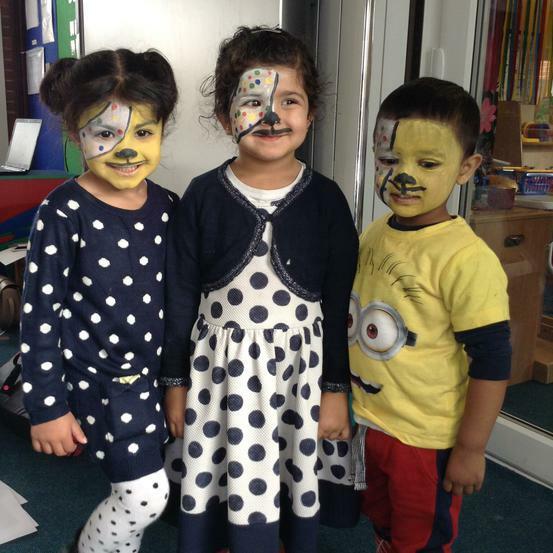 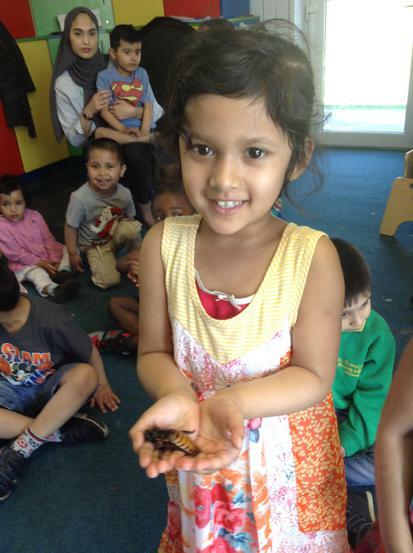 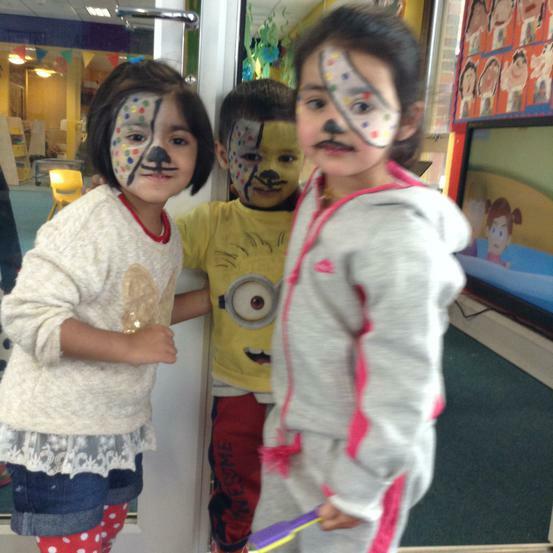 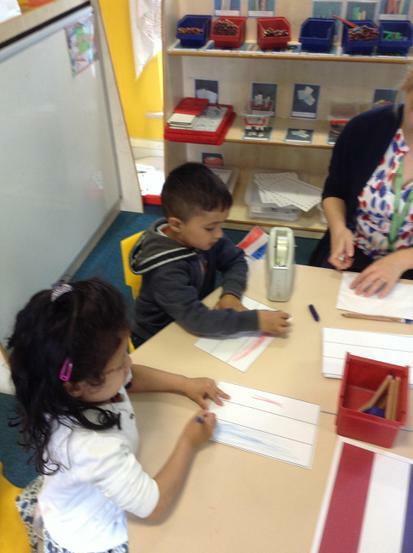 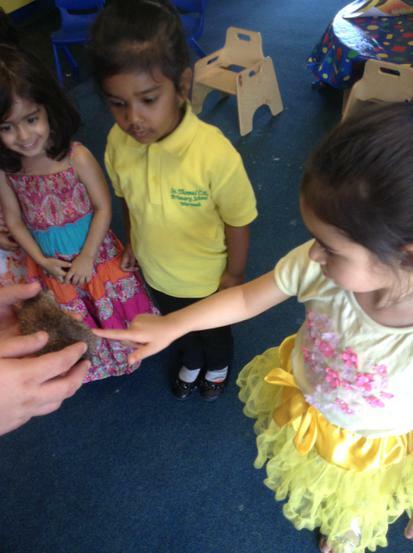 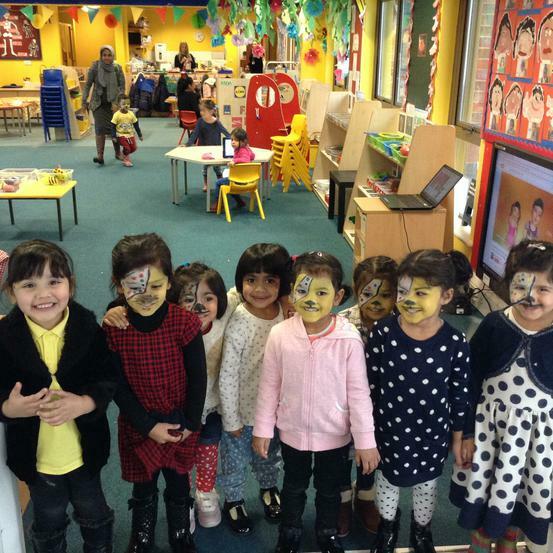 International Day- As part of the whole school international day Nursery looked at the country Holland. 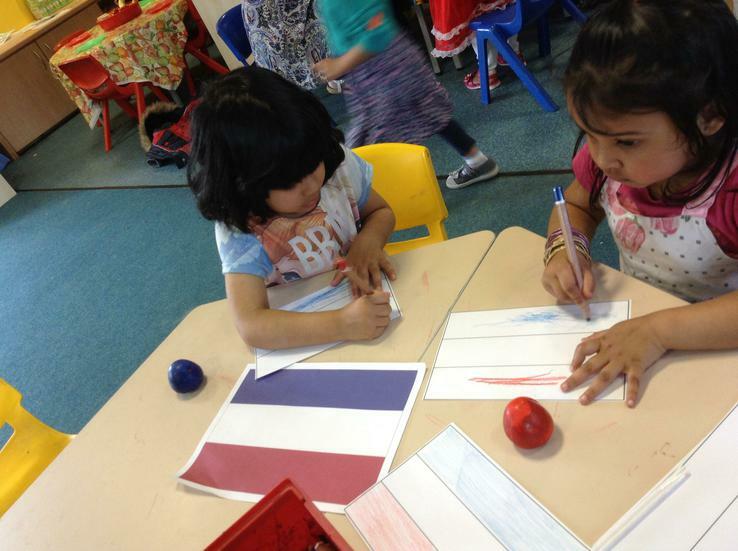 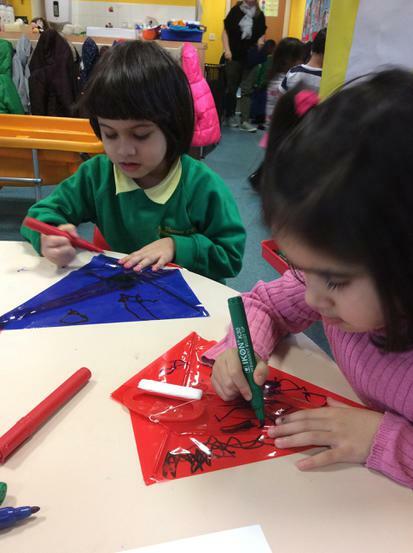 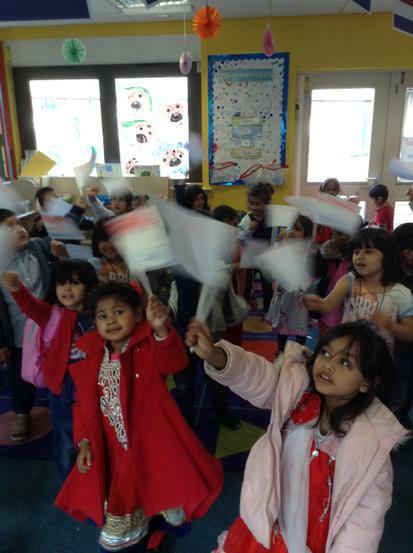 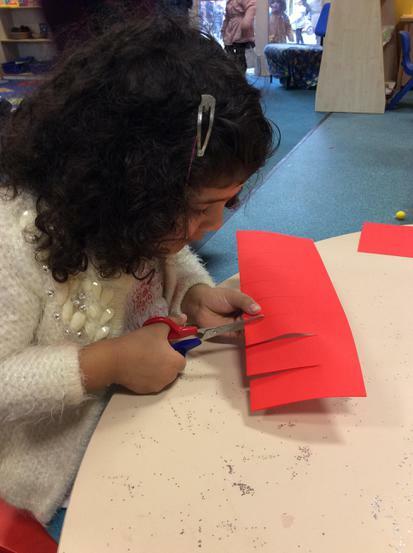 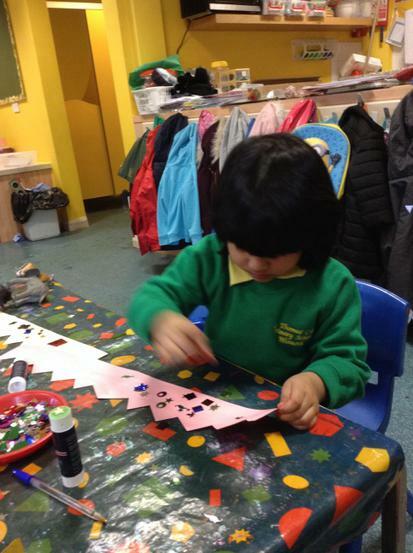 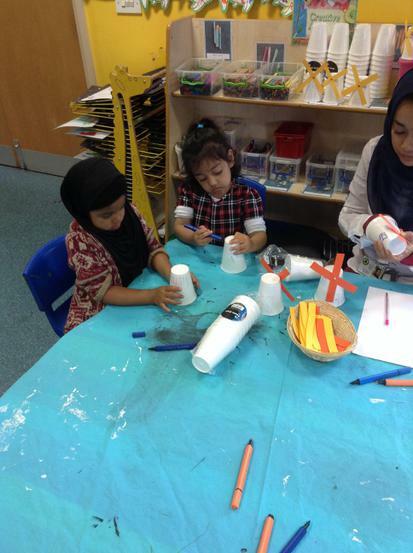 The children made tulips, windmills and flags. 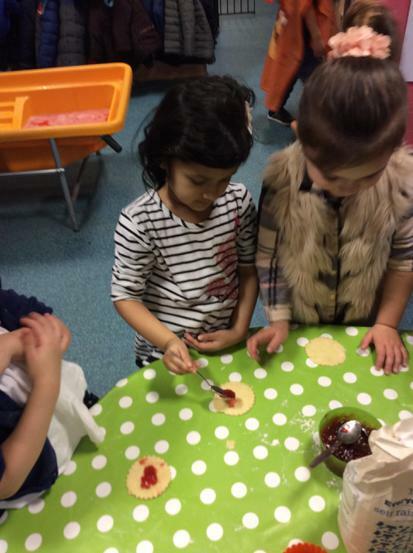 They also tasted Dutch pancakes and Edam cheese!! 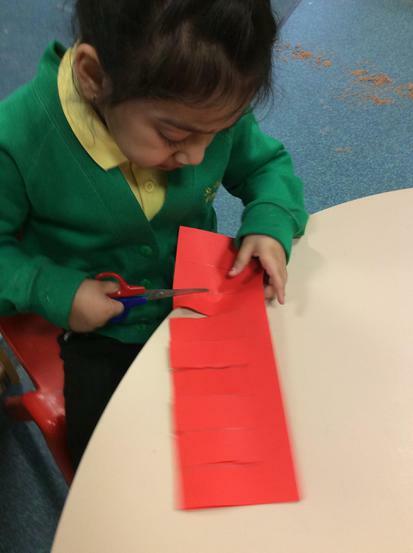 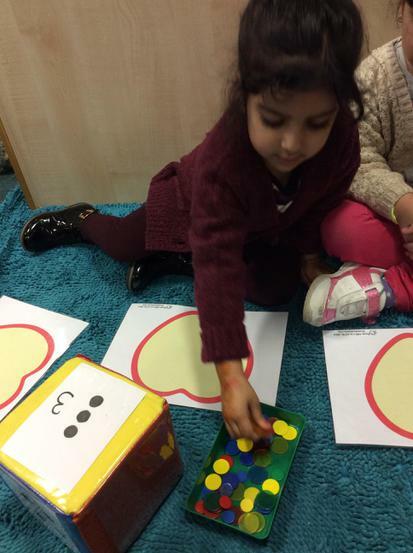 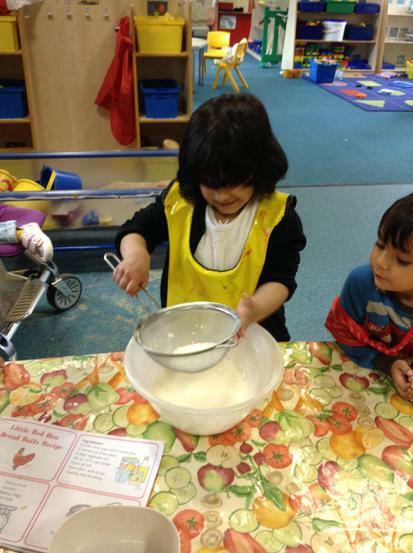 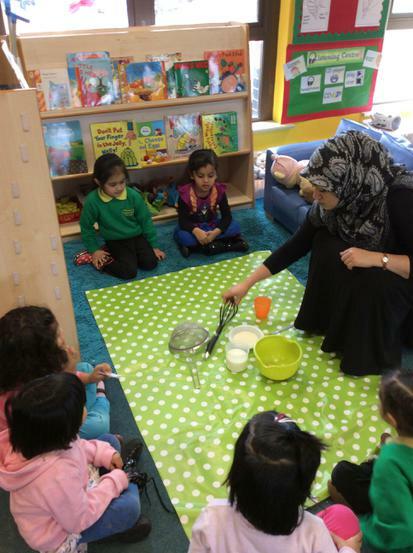 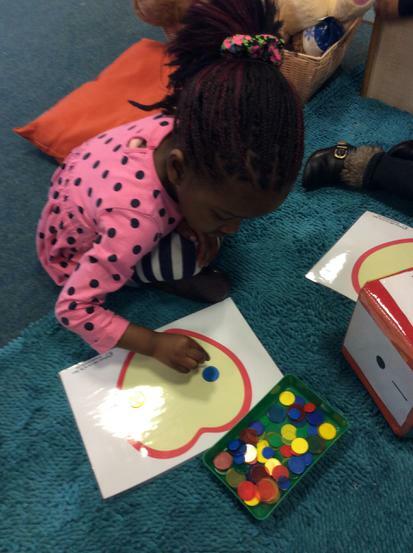 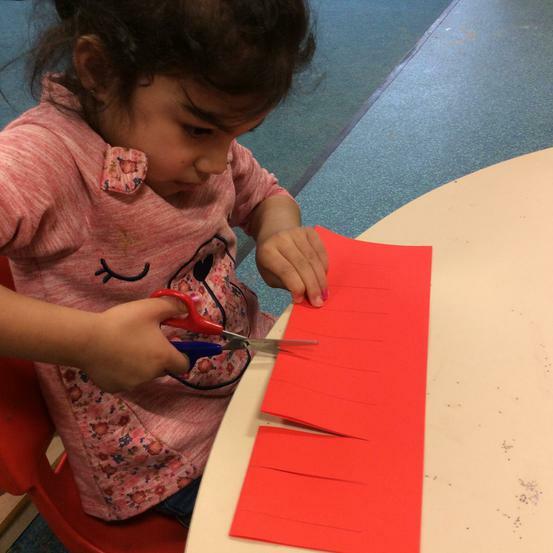 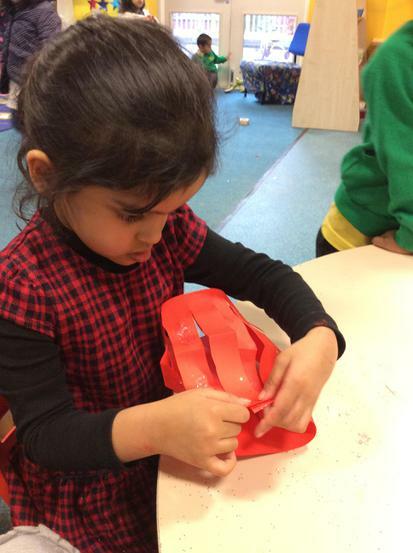 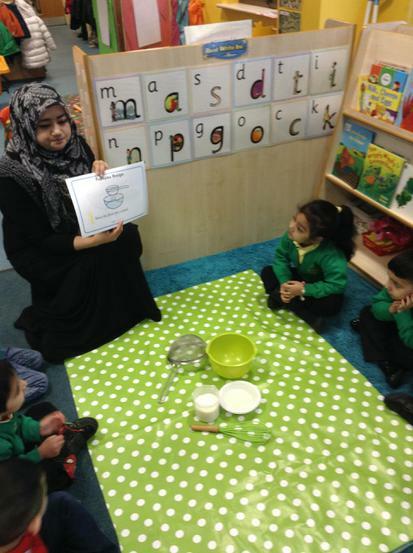 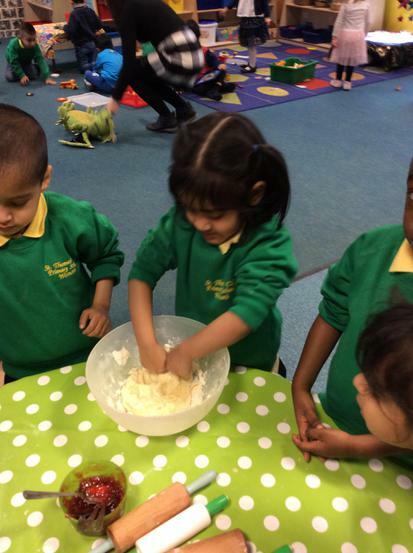 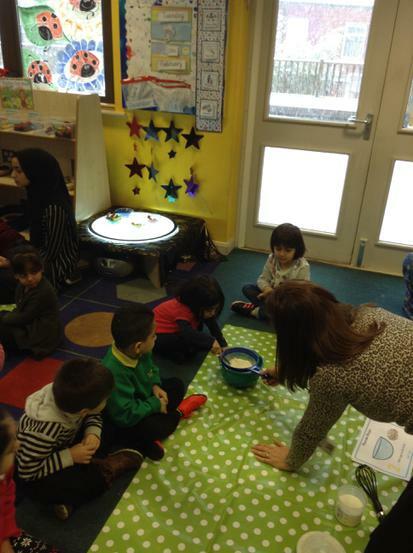 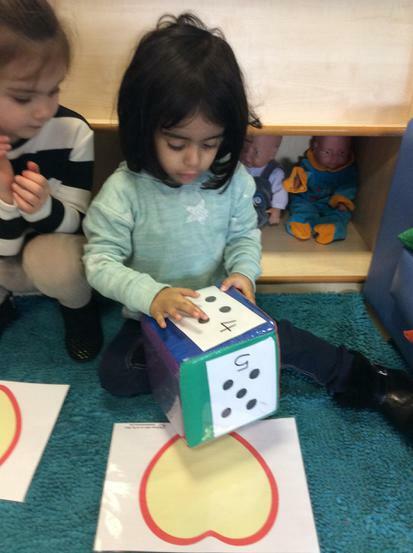 This week Nursery have been reading the story The Little Red Hen. 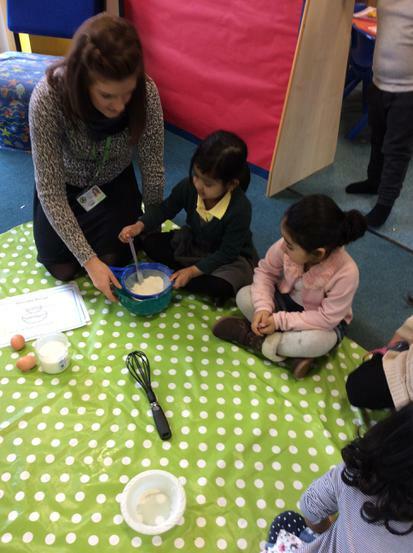 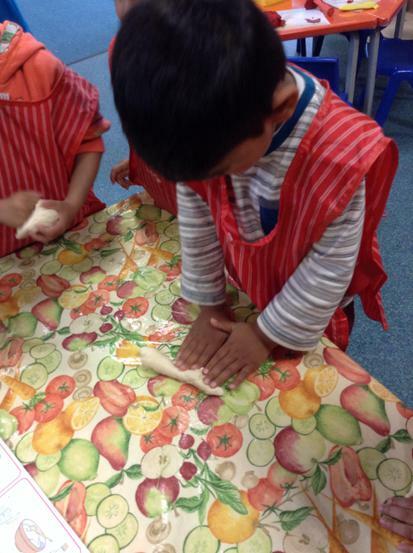 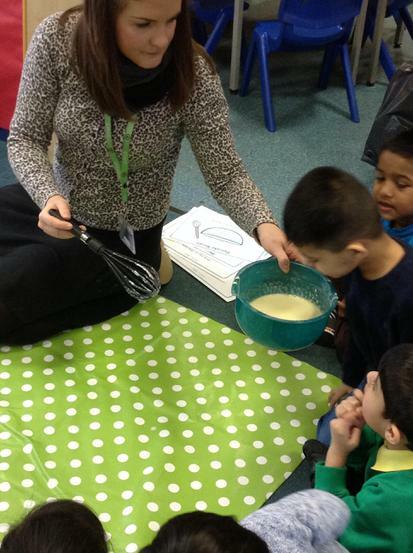 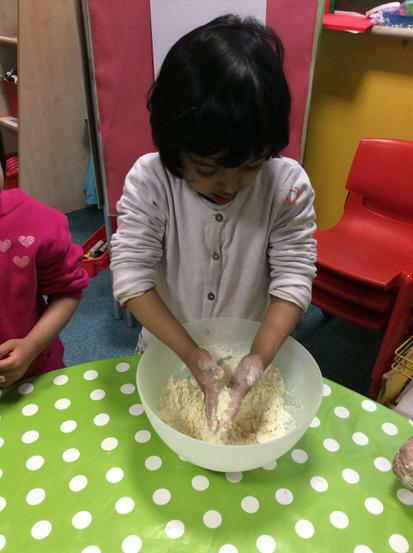 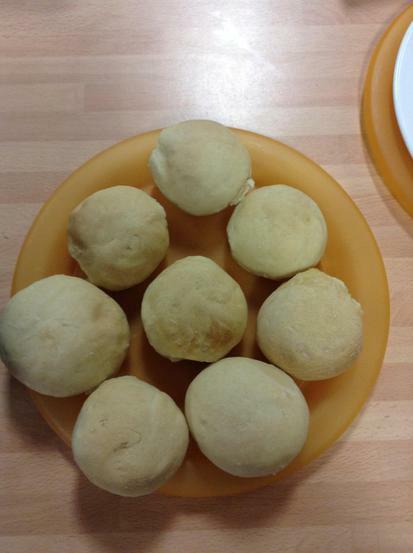 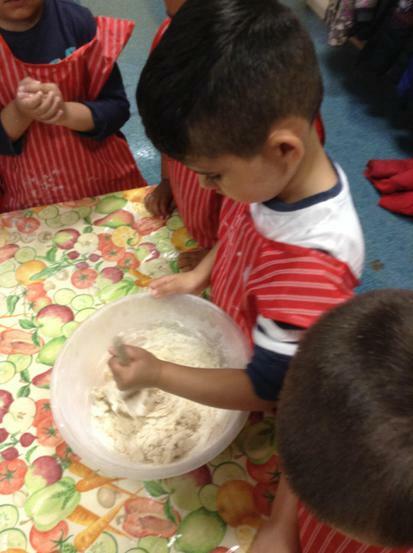 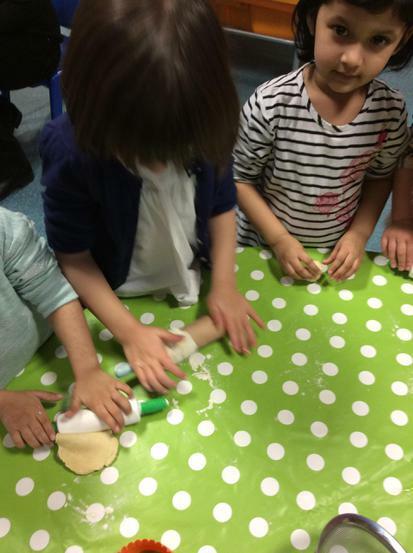 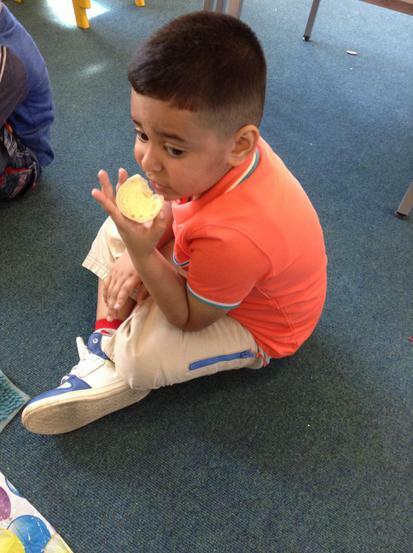 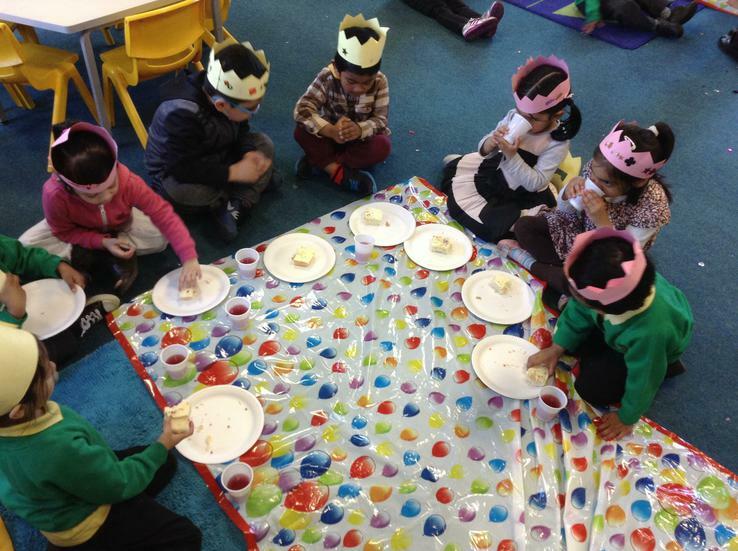 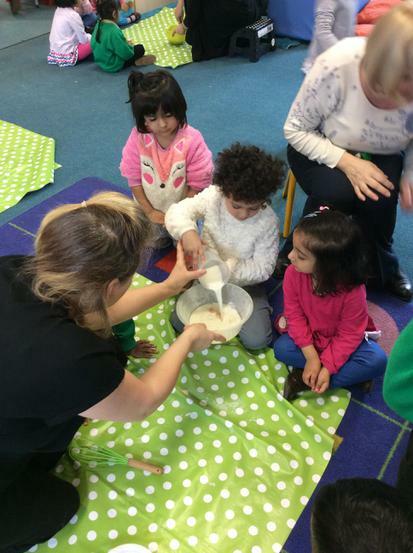 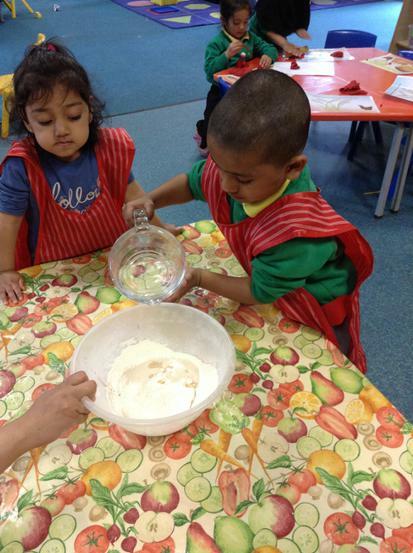 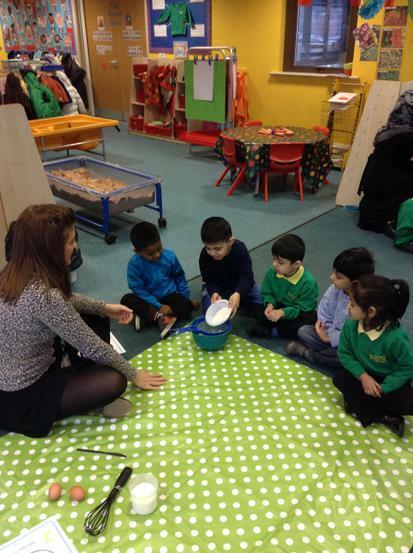 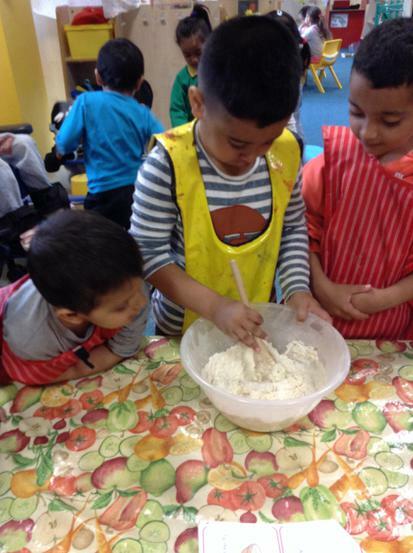 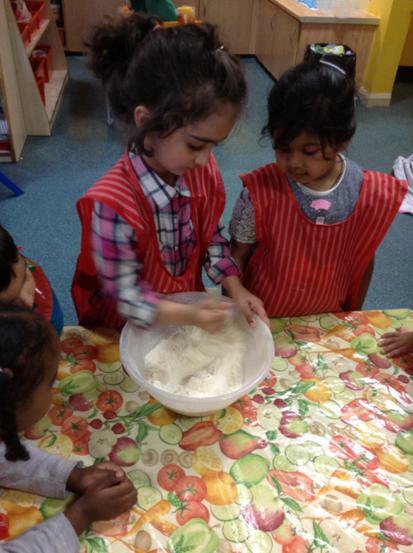 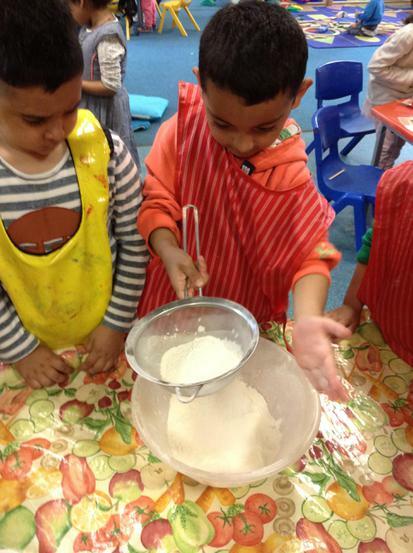 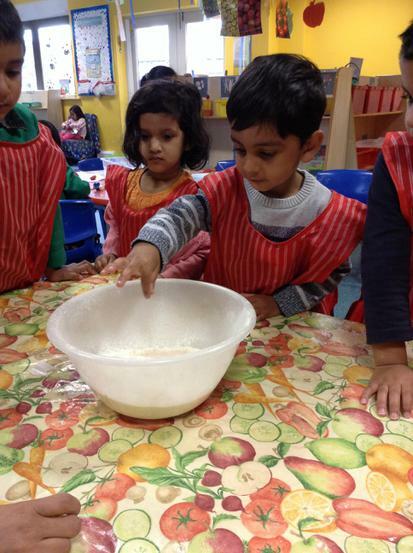 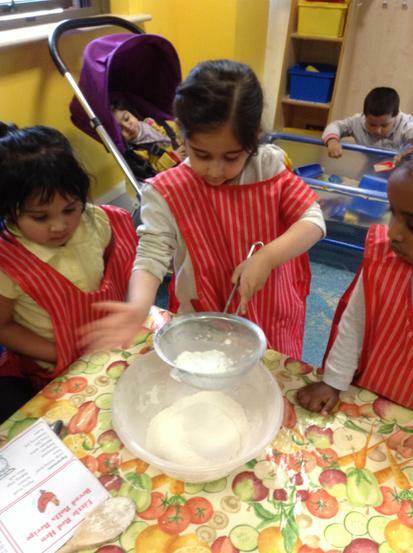 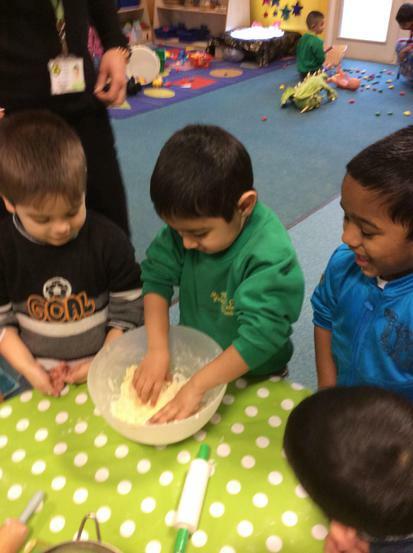 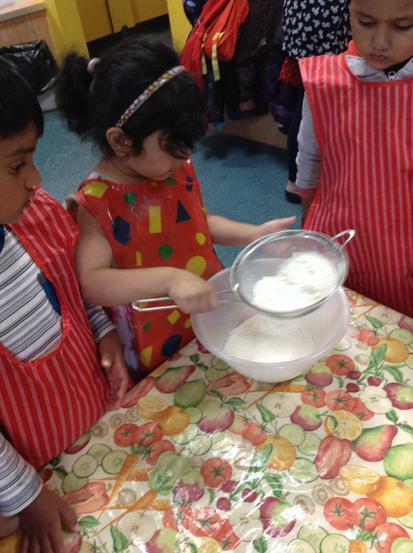 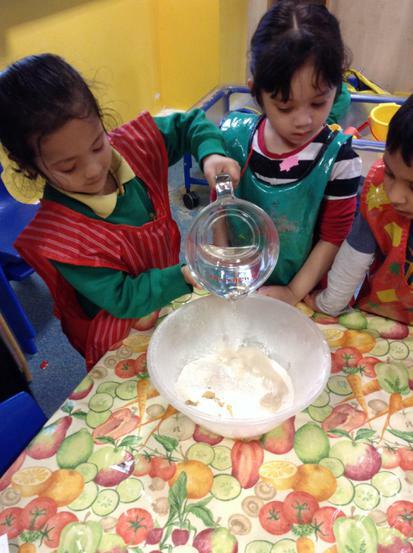 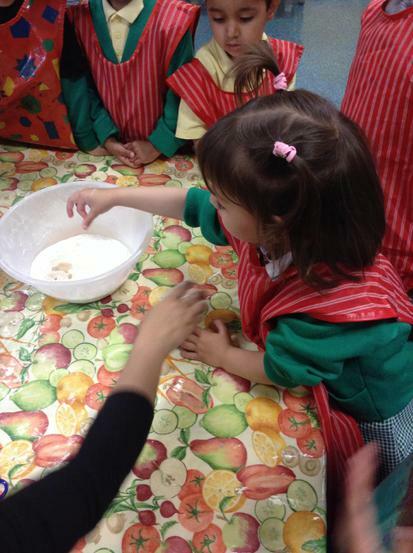 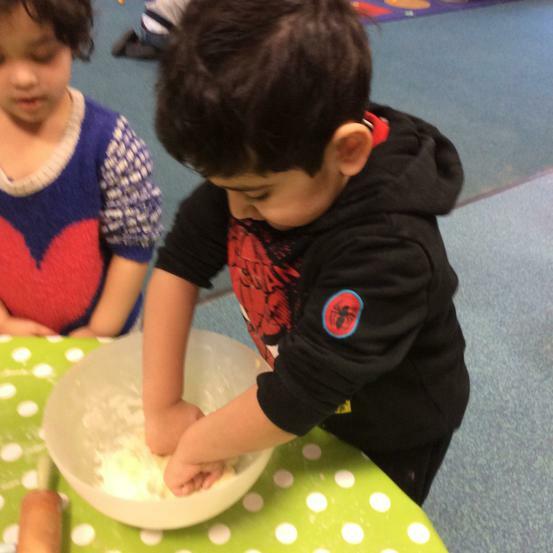 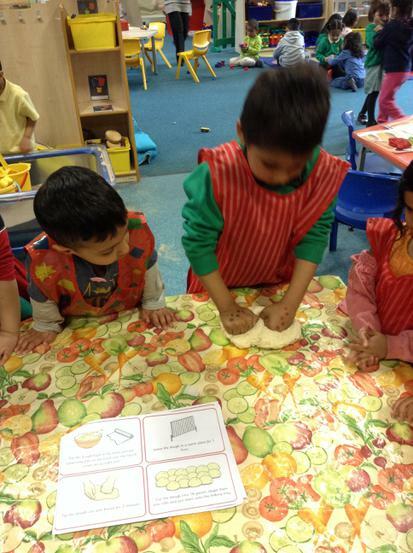 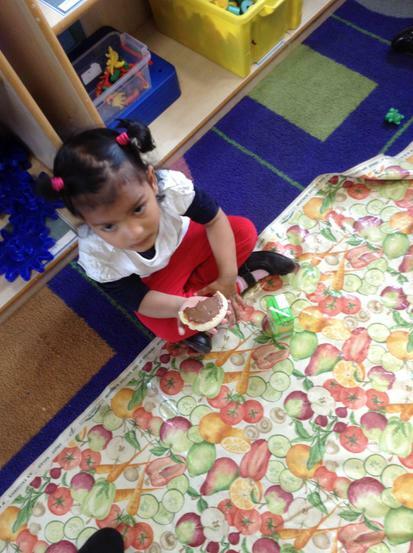 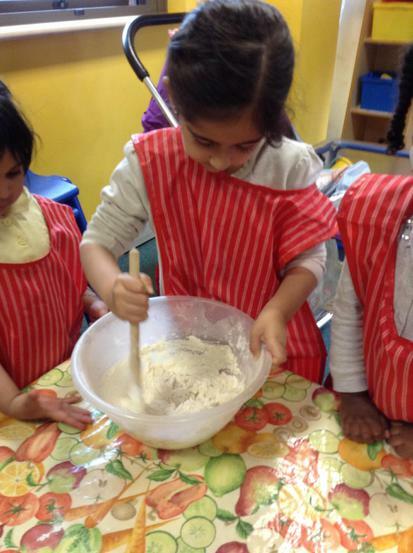 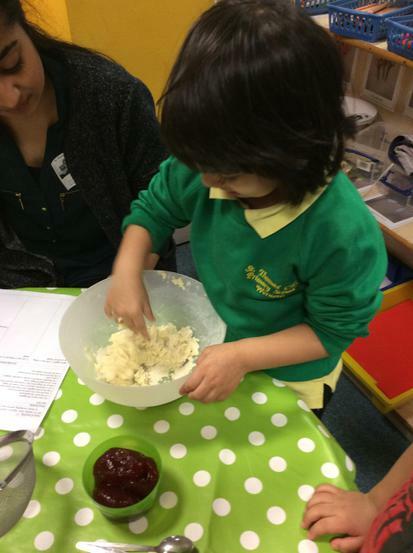 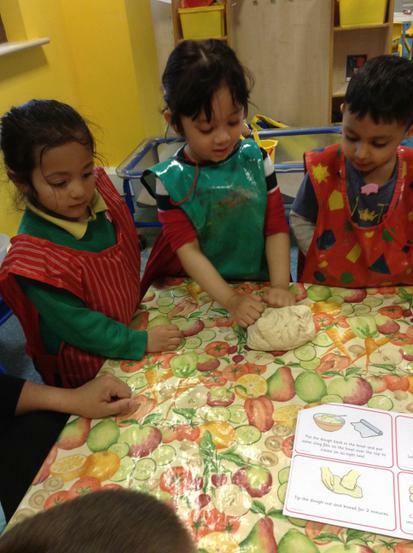 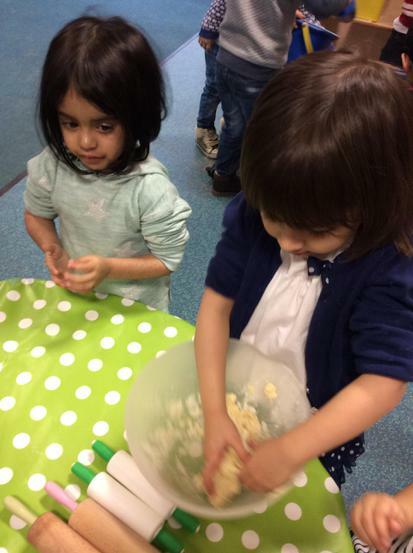 Like the hen in the story, the children baked their own bread. 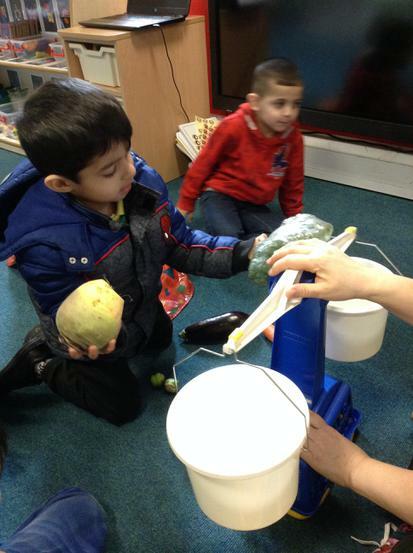 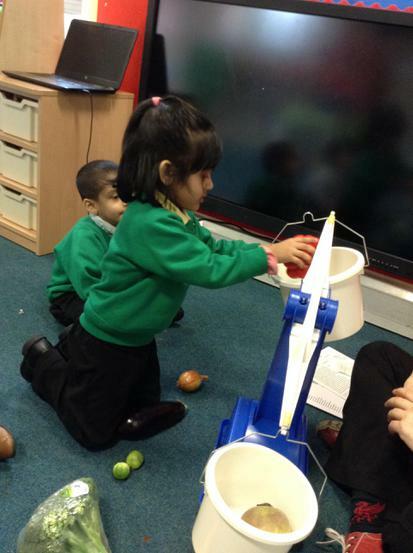 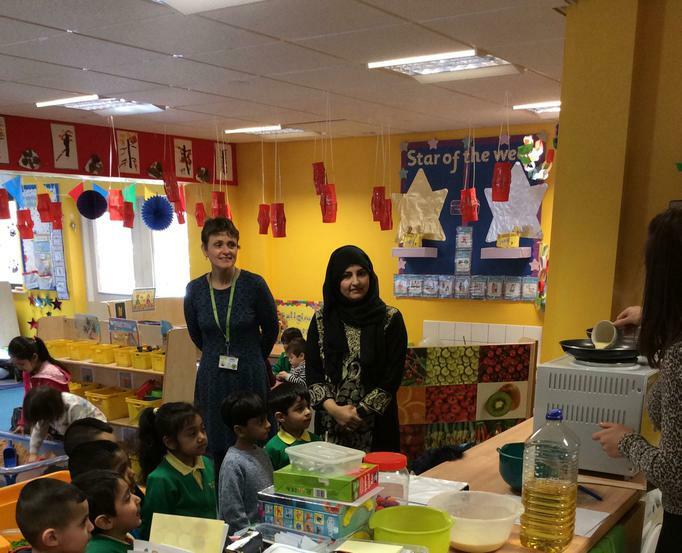 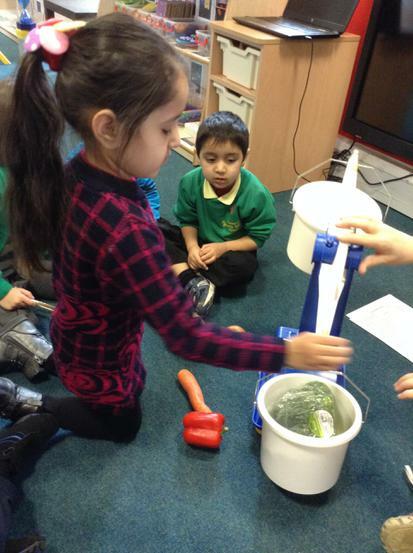 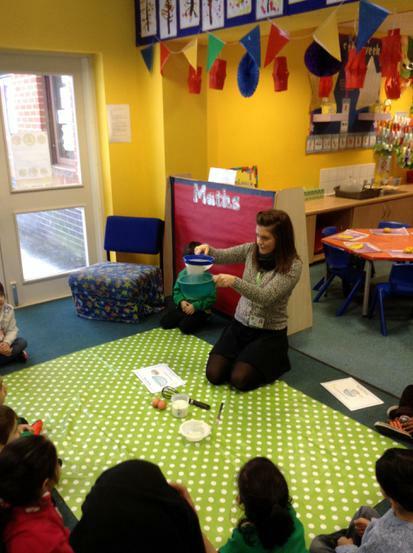 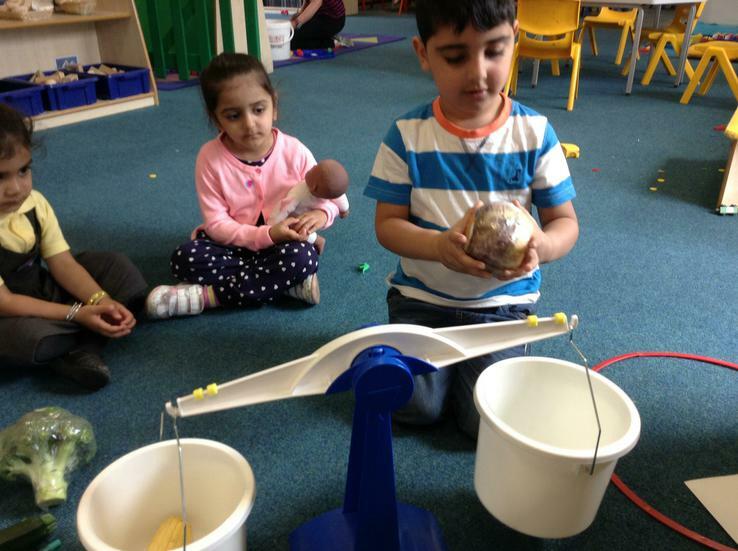 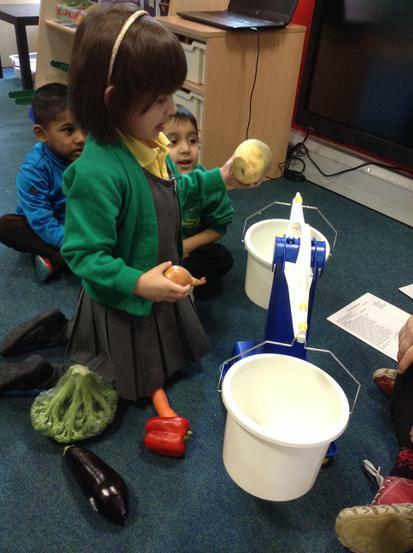 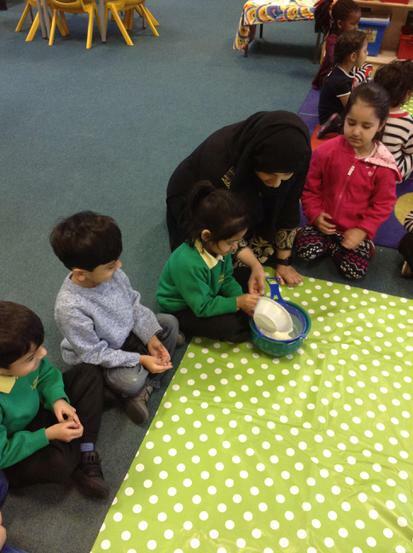 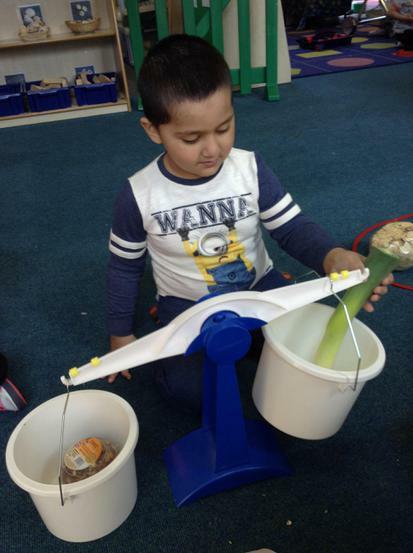 The Enormous turnip- as part of our week looking at the story 'The Enormous Turnip' the children weighed a selection of vegetables to see whether they were heavier or lighter than a turnip. 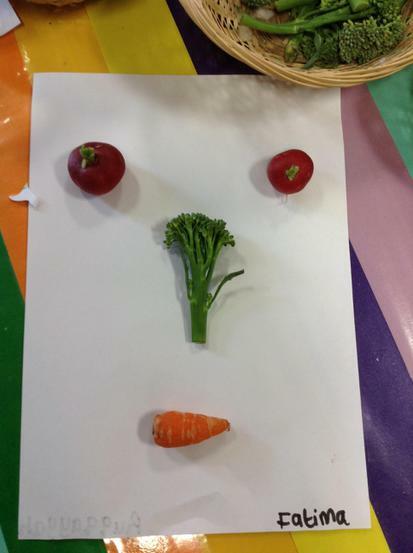 In Nursery this week we looked at the artist Giuseppe Arcimboldo who created faces using fruit and vegetables. 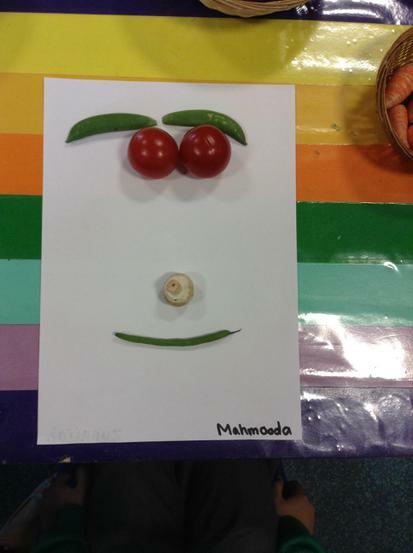 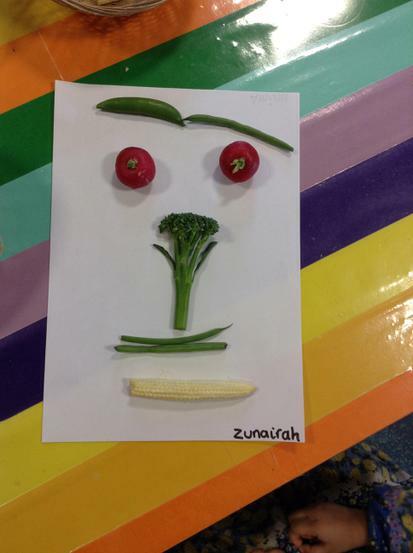 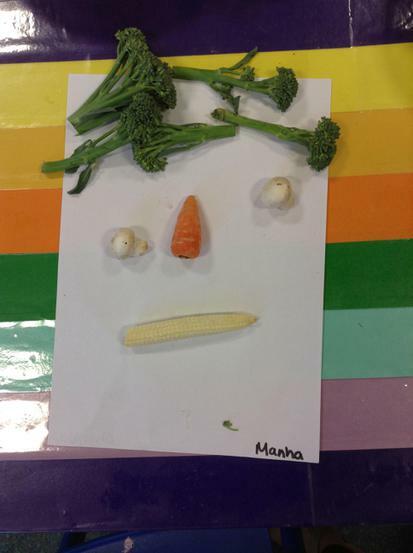 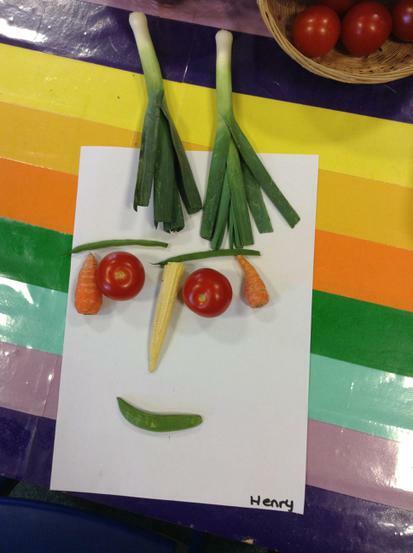 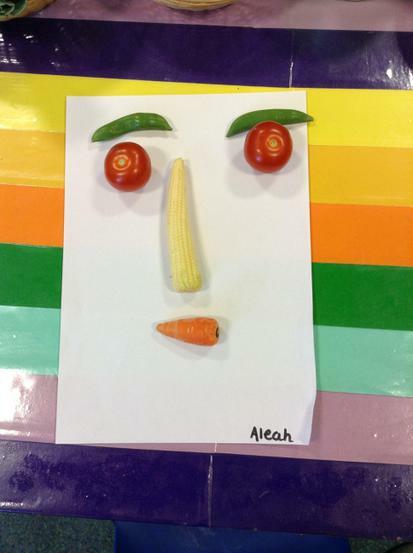 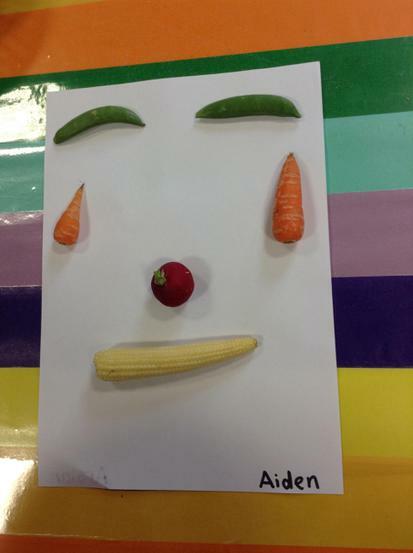 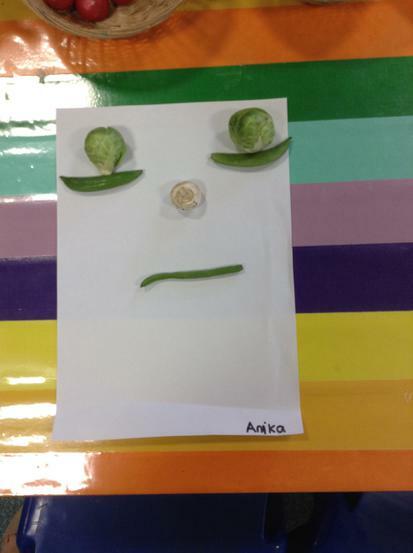 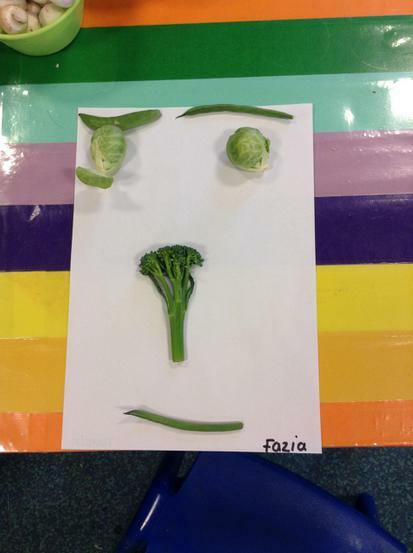 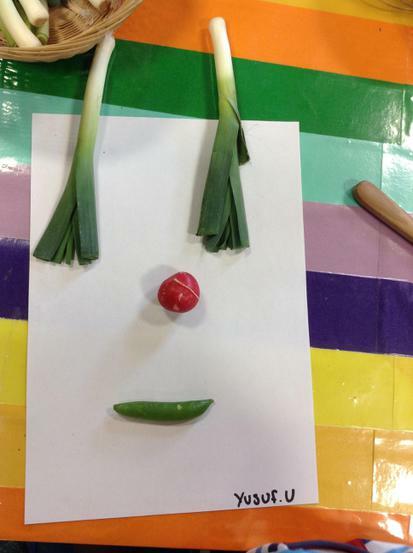 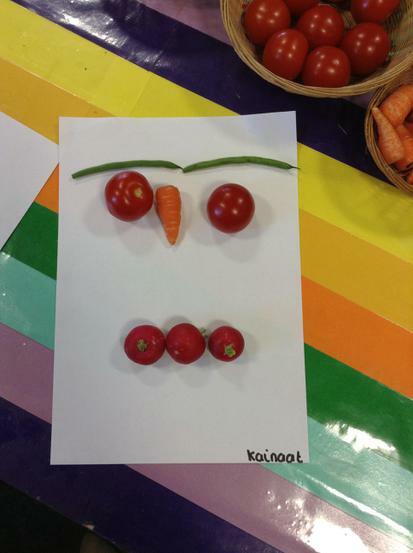 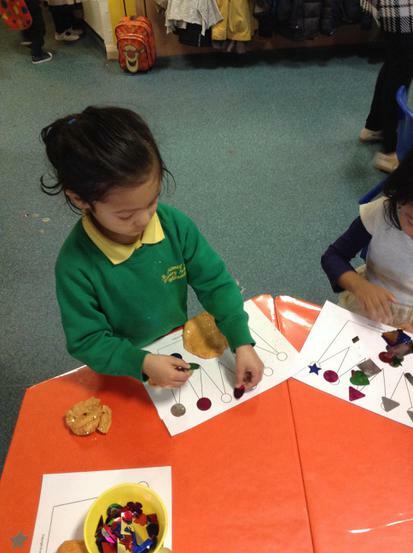 After looking at the artist's work the children made their own face using a selection of vegetables. 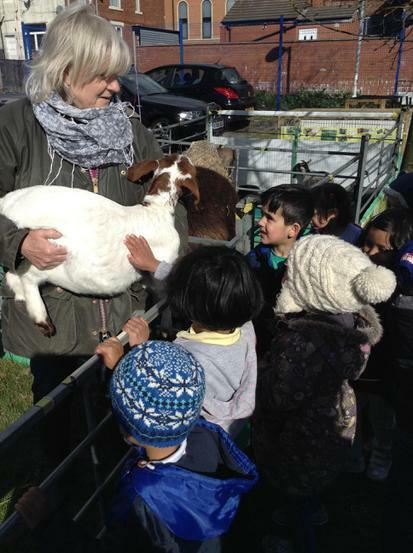 Our new topic this half term is 'On the Farm'. 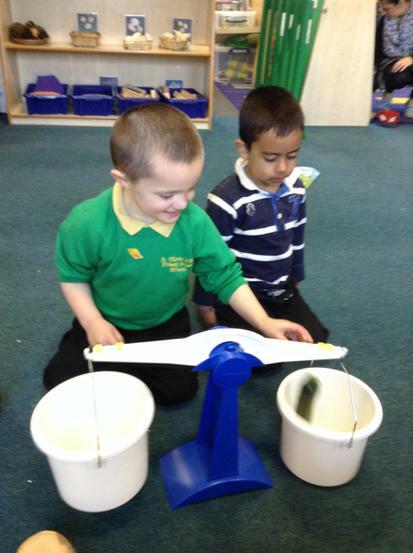 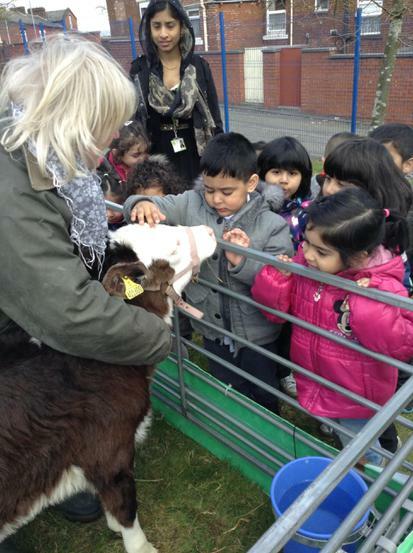 During this topic a farm will be coming to visit St Thomas' Nursery. 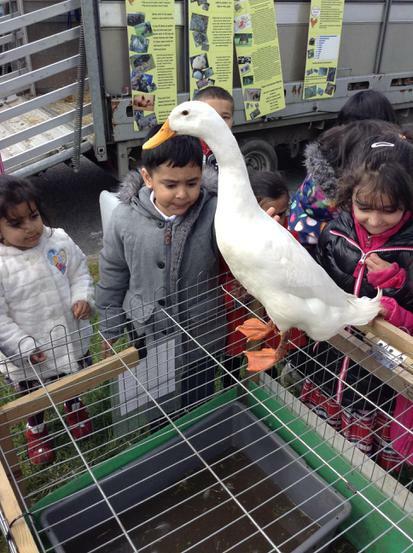 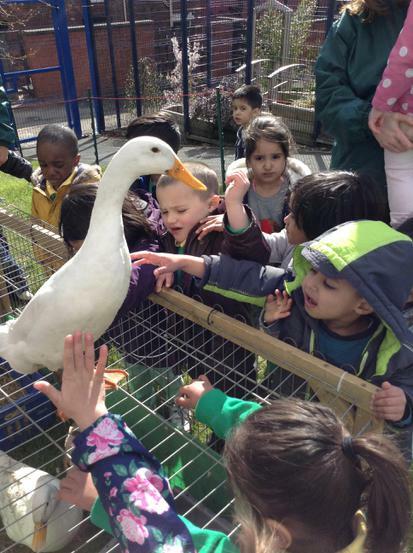 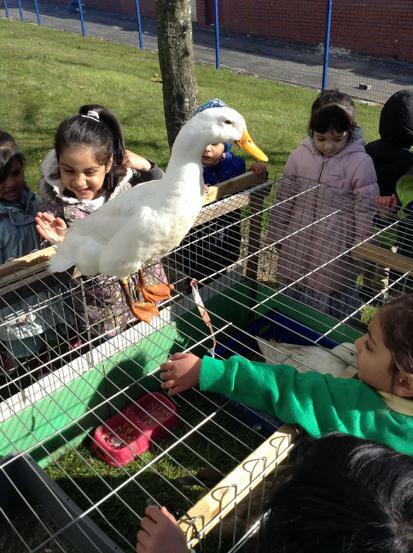 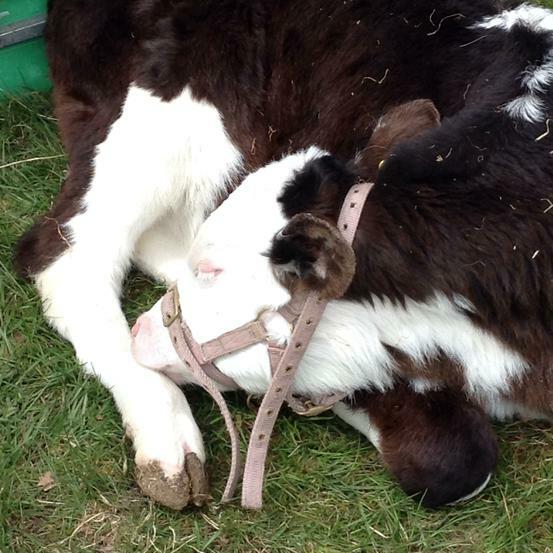 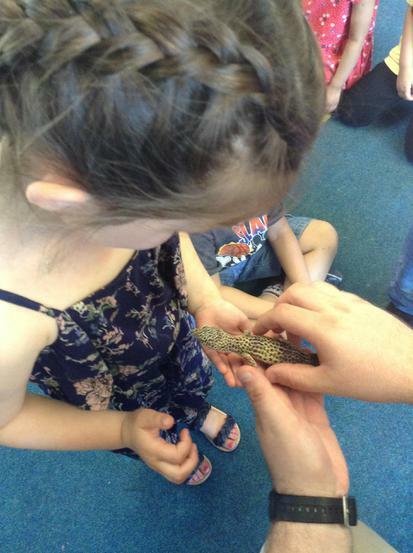 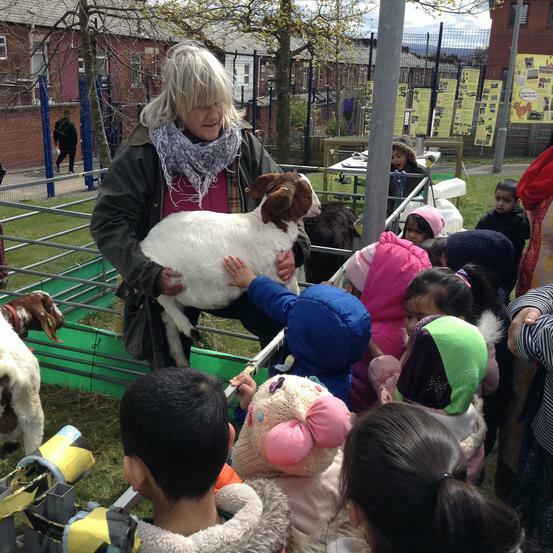 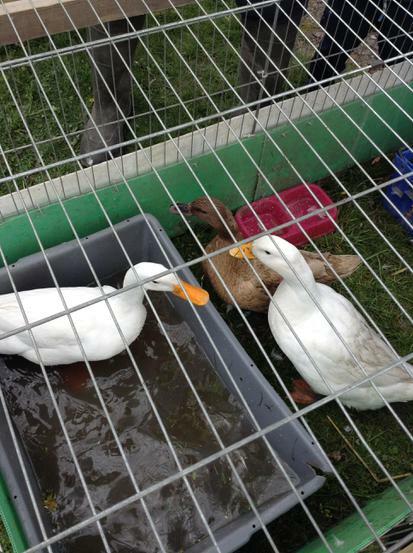 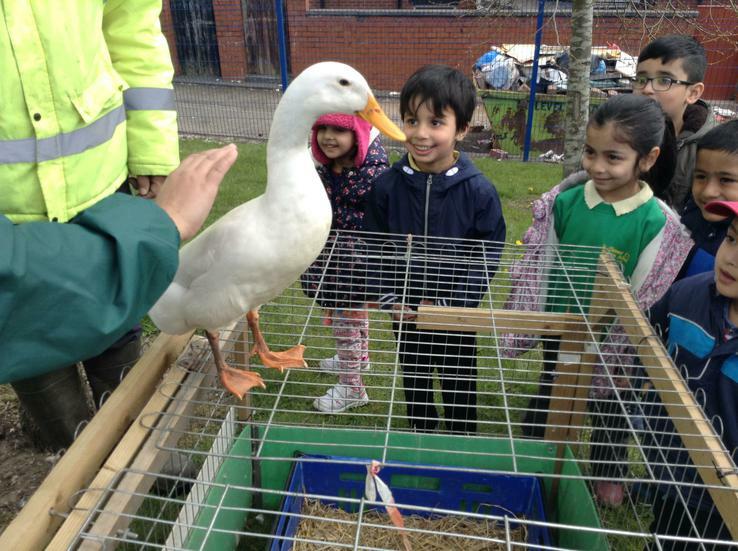 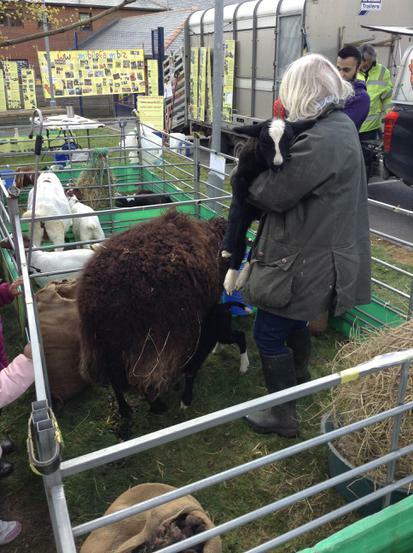 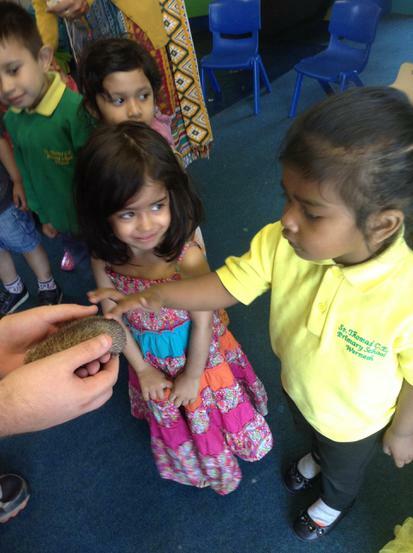 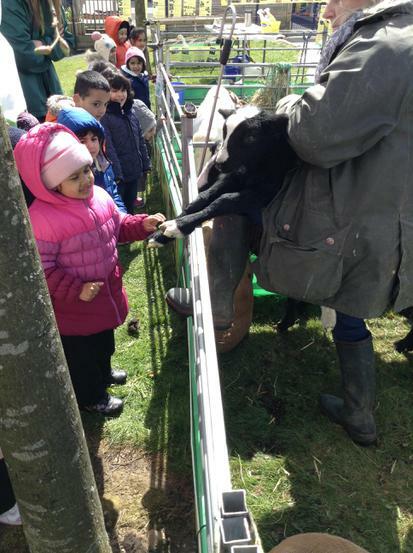 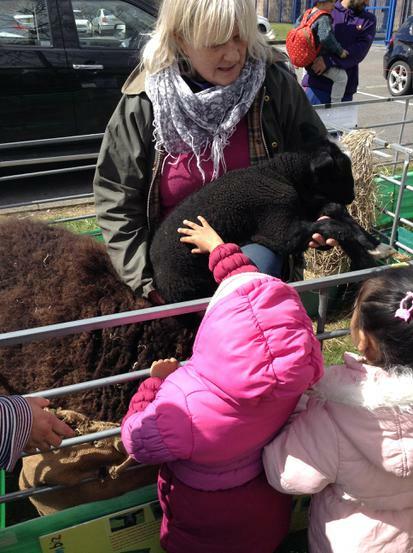 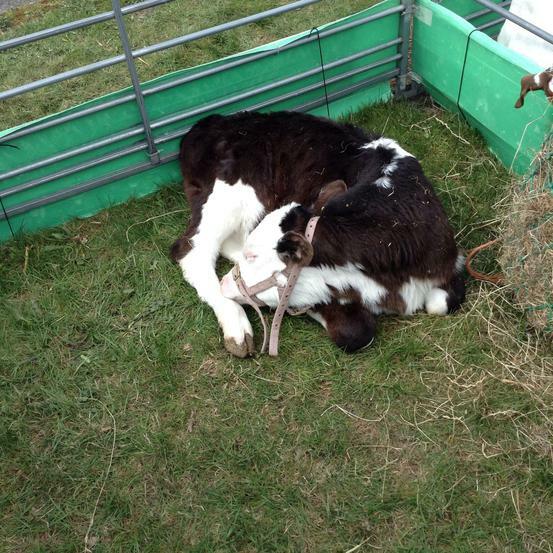 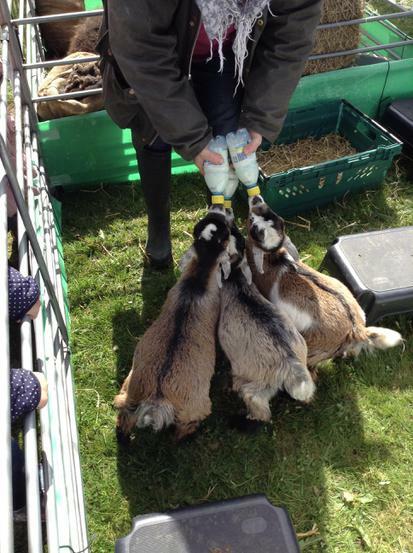 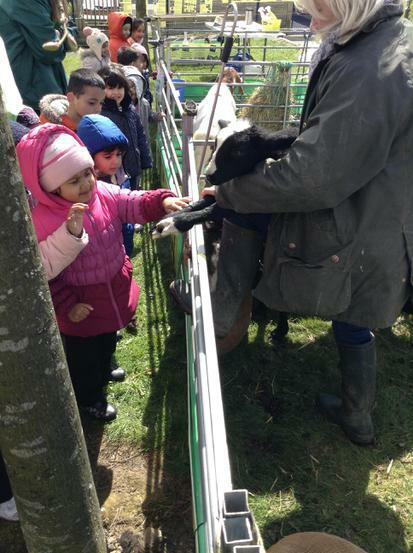 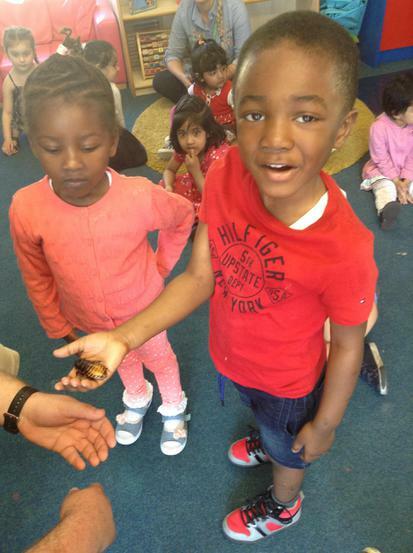 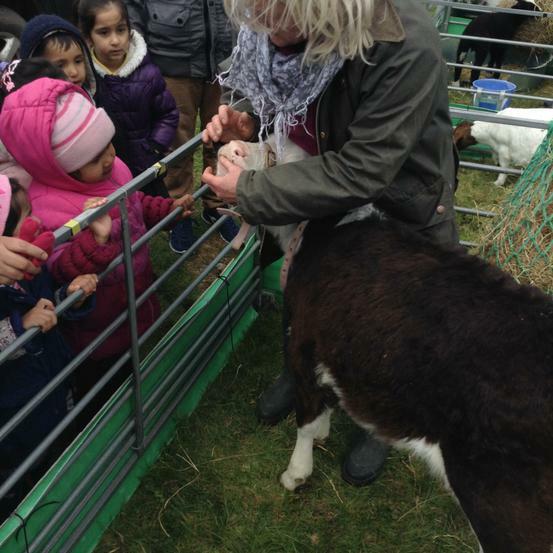 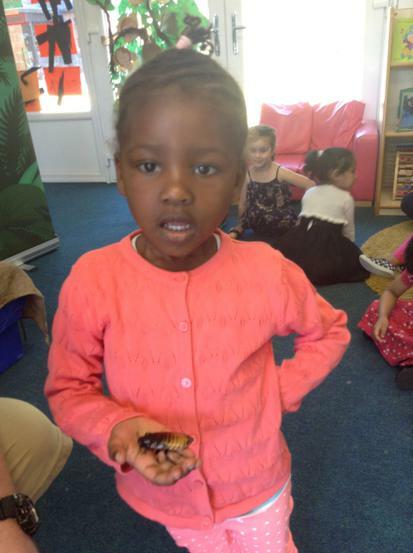 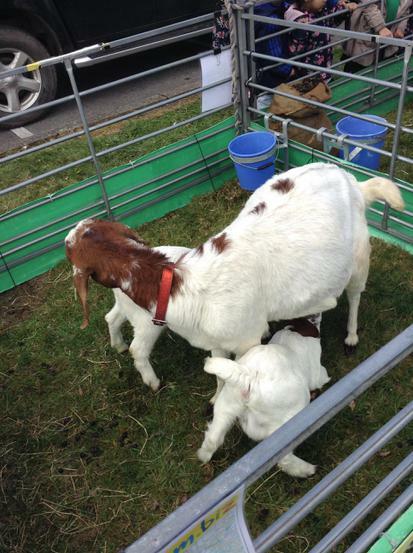 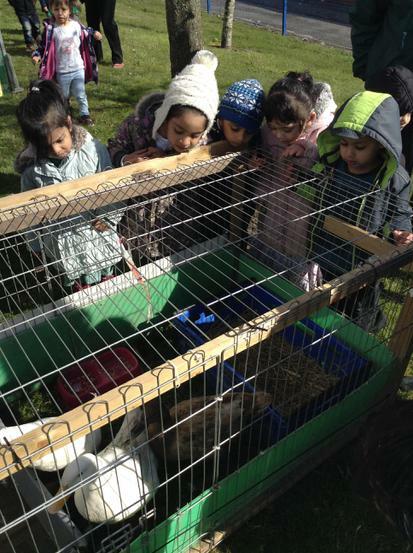 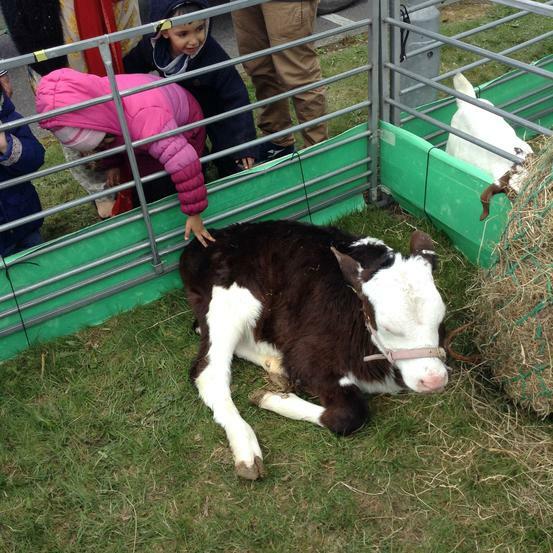 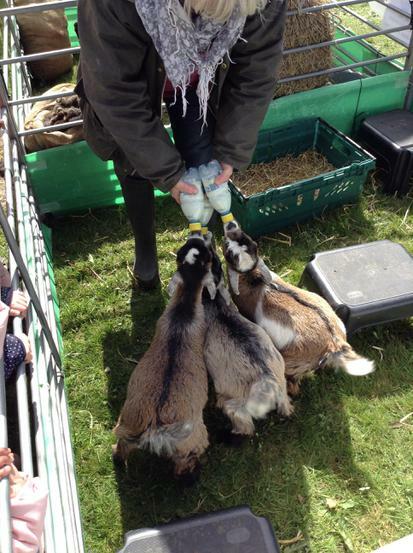 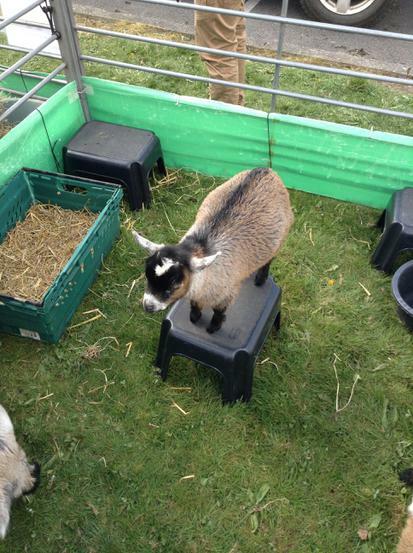 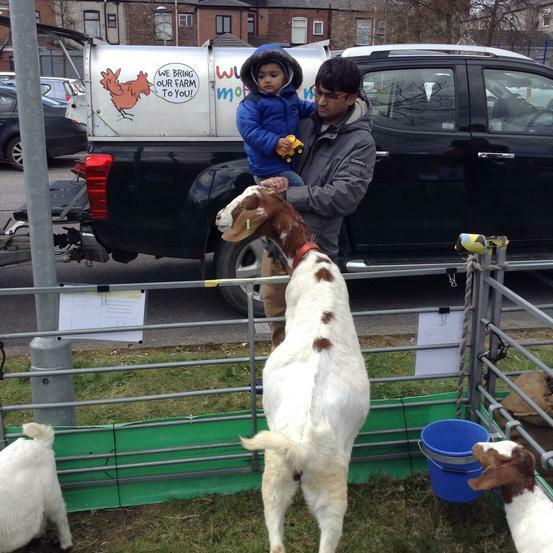 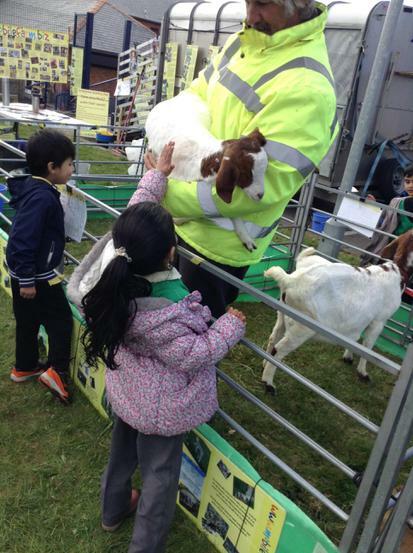 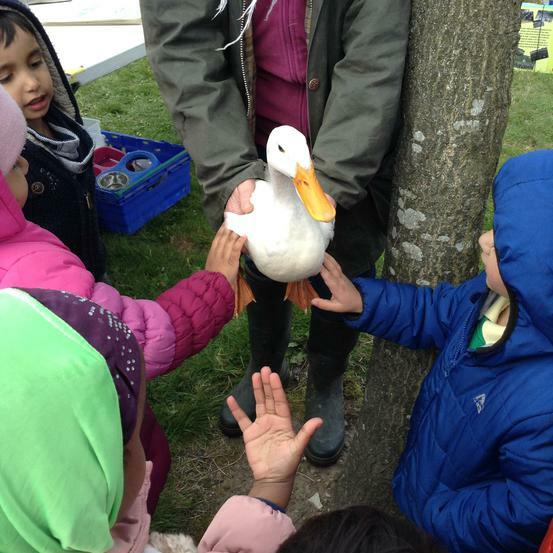 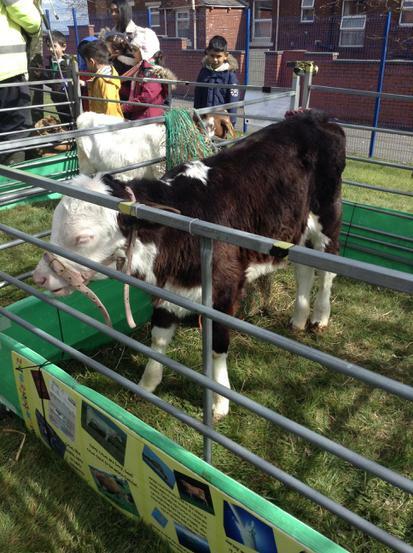 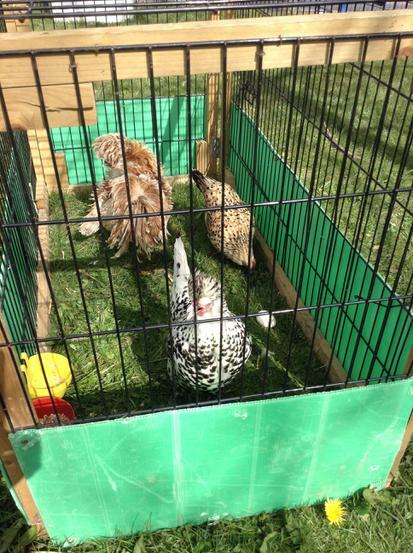 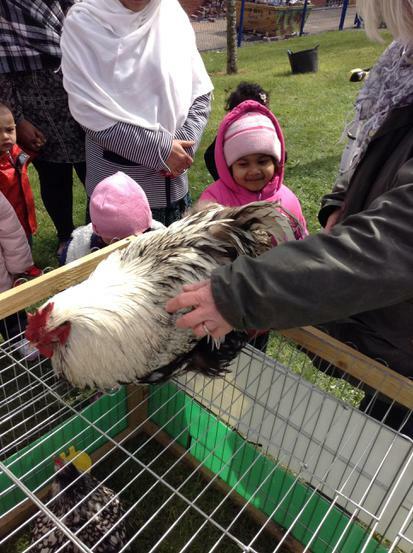 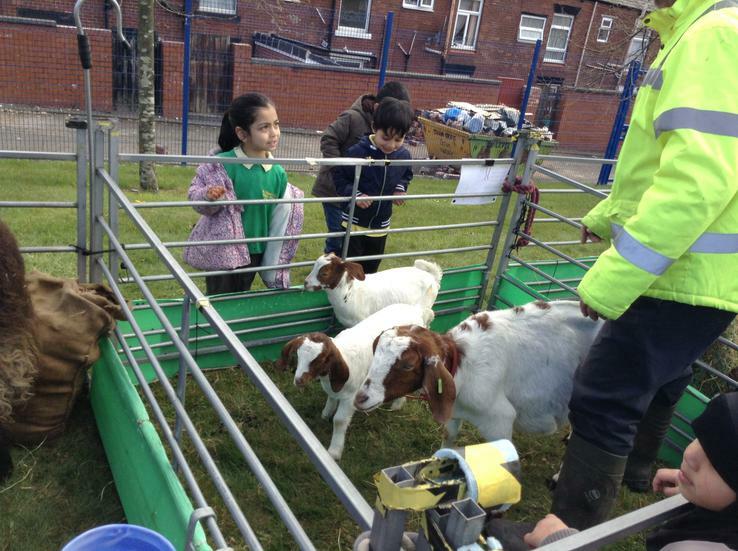 The children will get to experience the animals first hand when a farm visit the school on Tuesday 26th April. 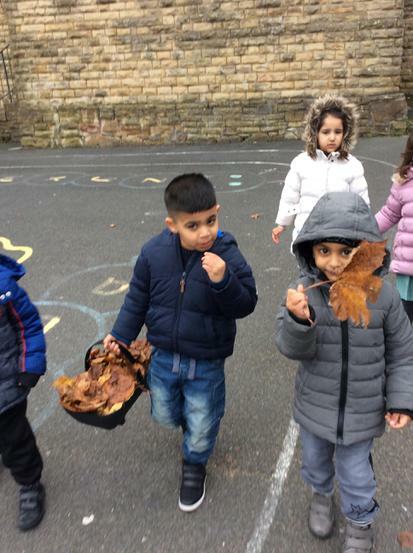 I hope you all enjoyed the half term break. 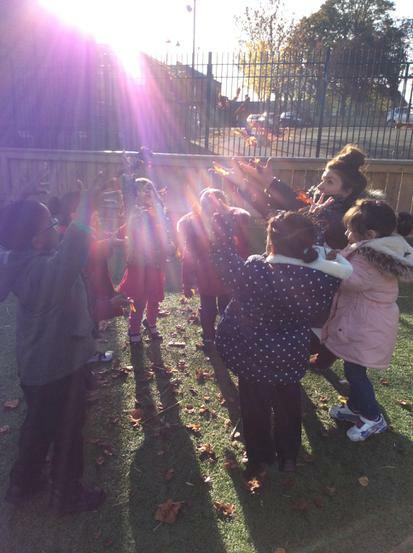 This half term the children will be learning all about light and dark. 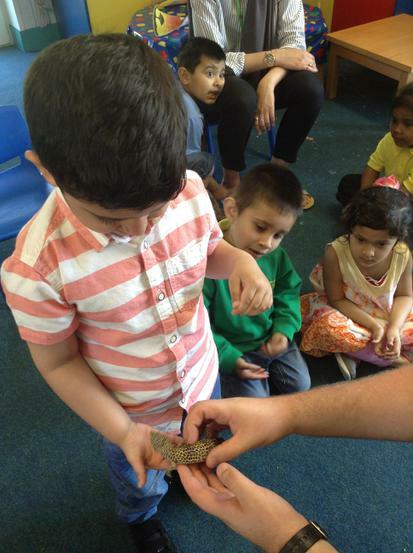 The children will be finding out about nocturnal animals, shadows, the moon and different light sources. 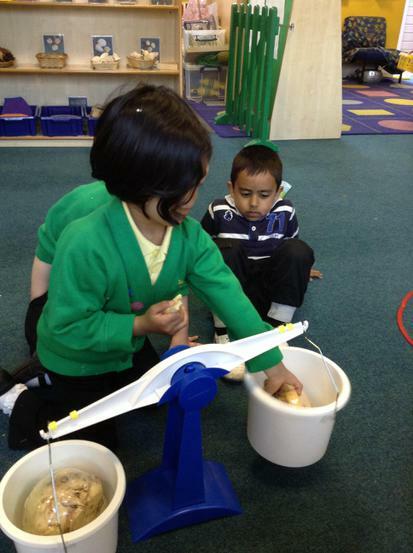 The role play area has been turned into a dark den where the children can explore different light sources. 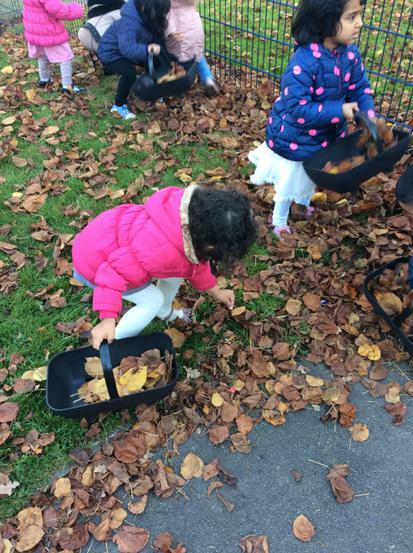 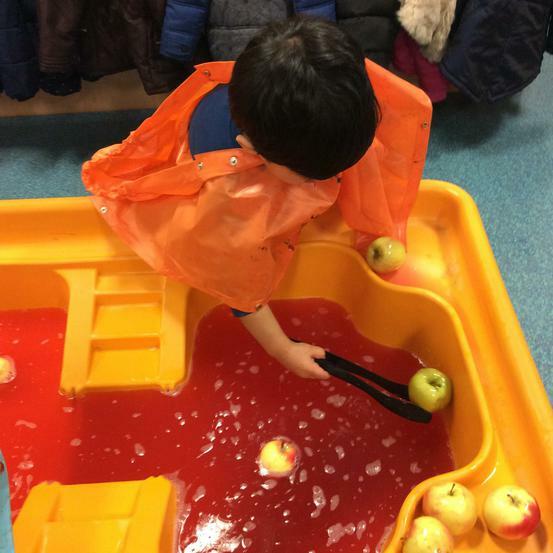 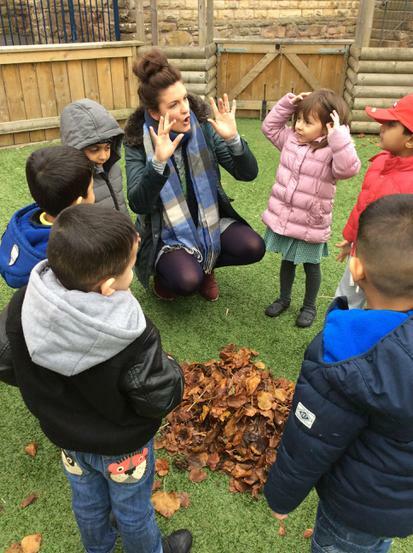 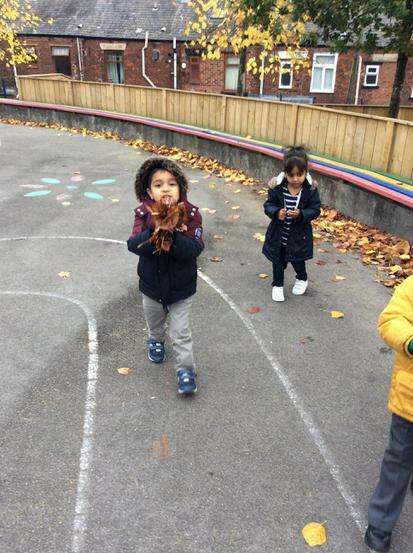 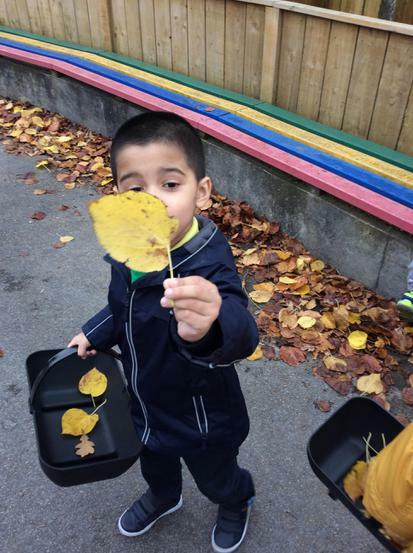 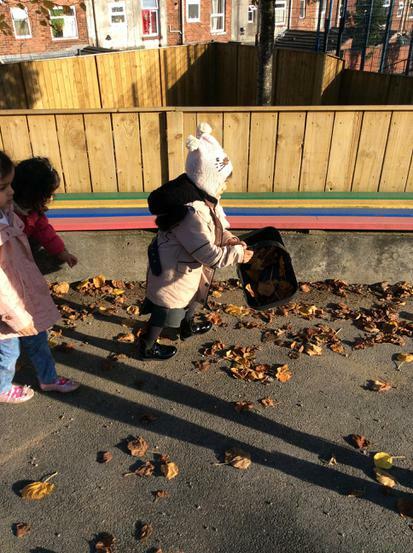 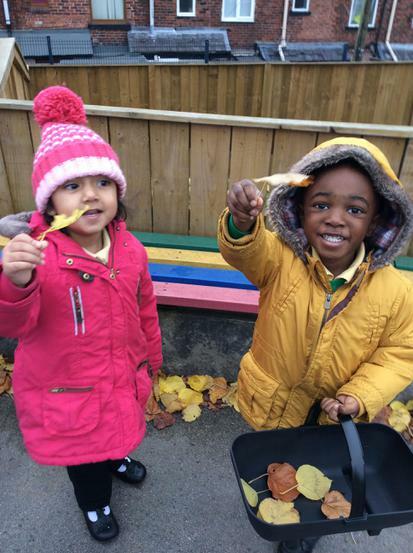 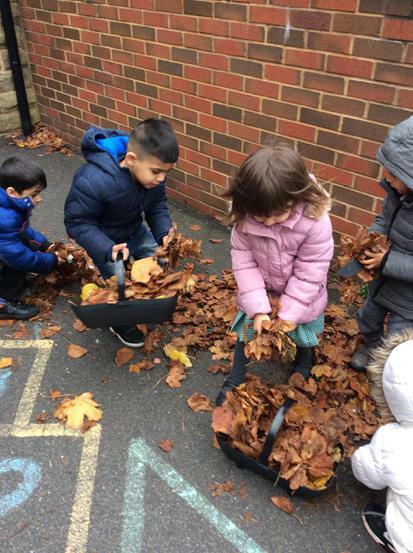 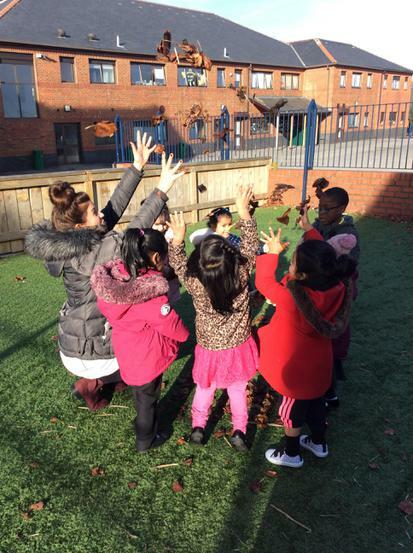 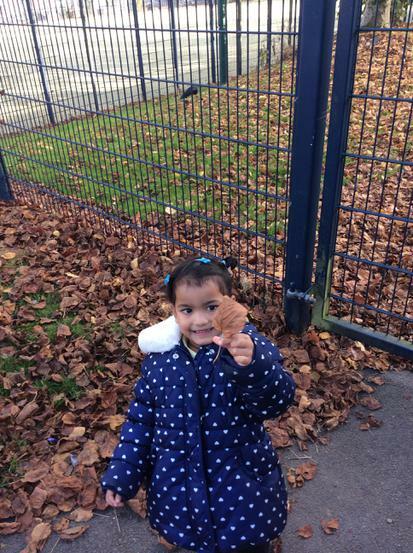 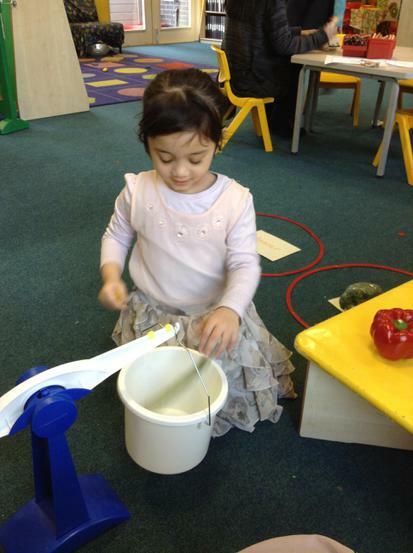 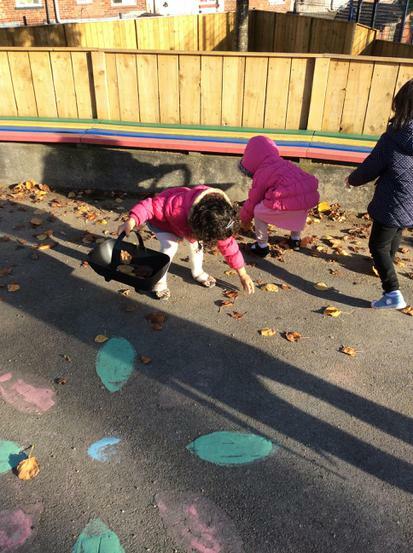 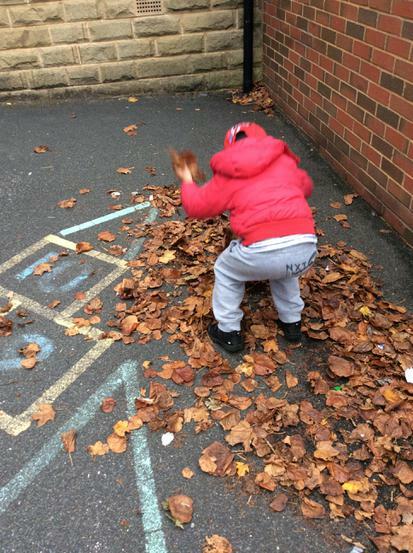 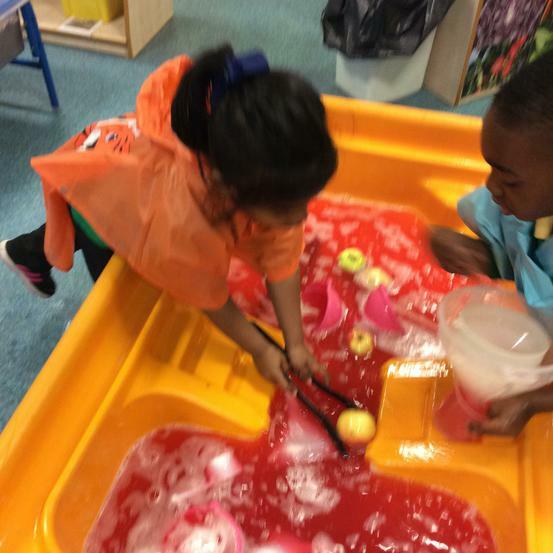 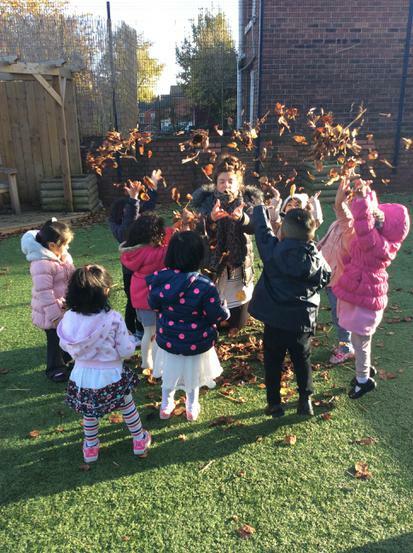 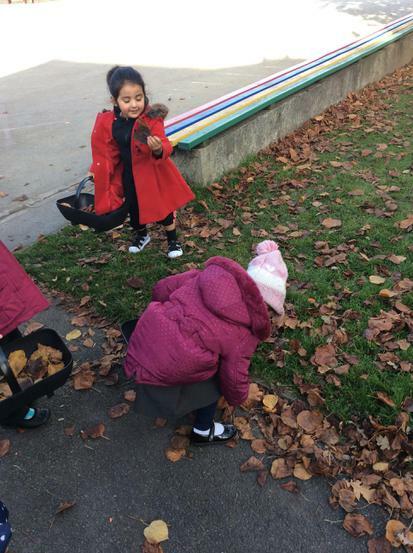 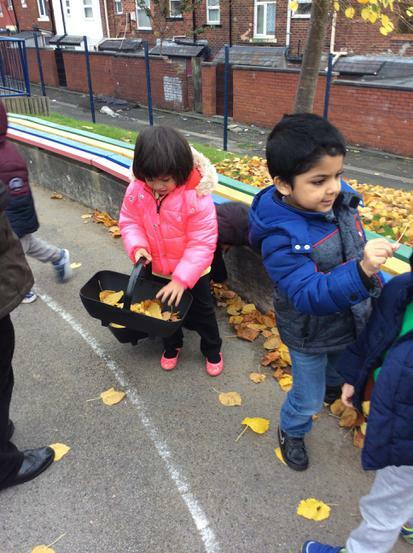 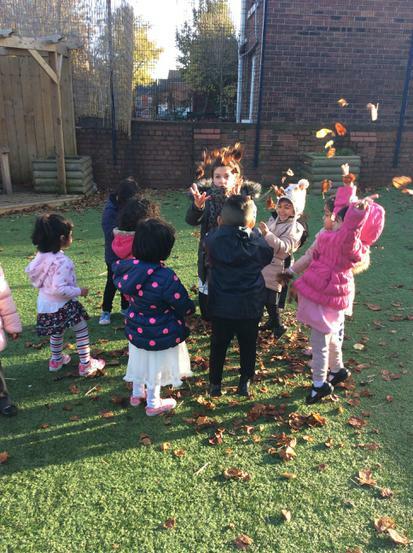 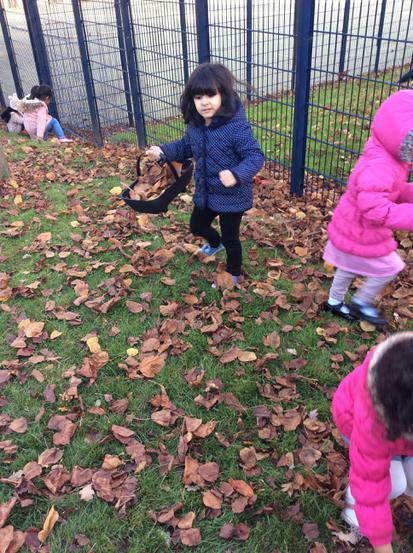 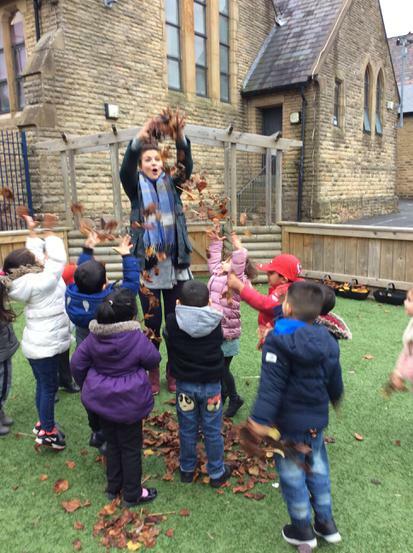 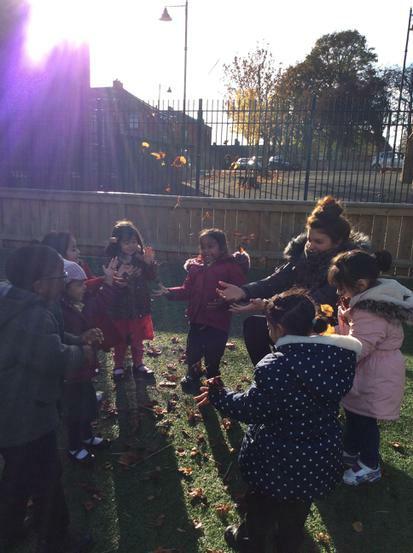 In Nursery the children have access to the outdoors in all weathers. 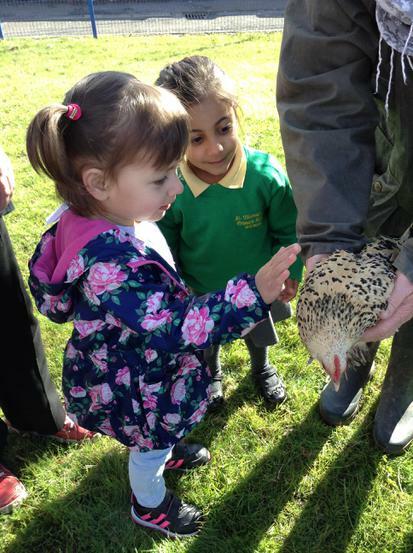 If your child owns a pair of wellingtons would they be able to bring them to Nursery in a bag on rainy days. 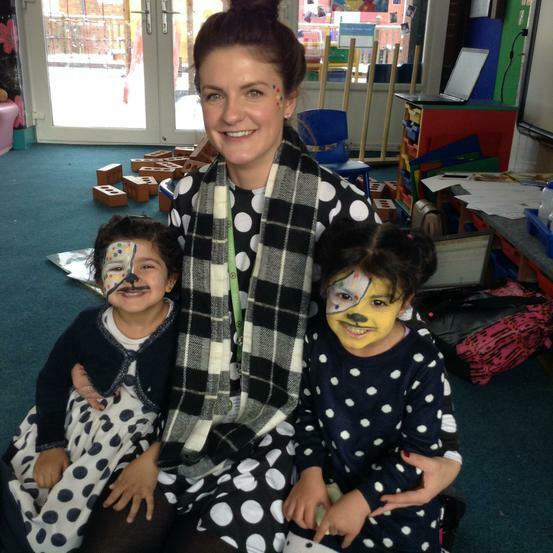 Mrs Jagger (Nursery Manager) welcomes you to Nursery. 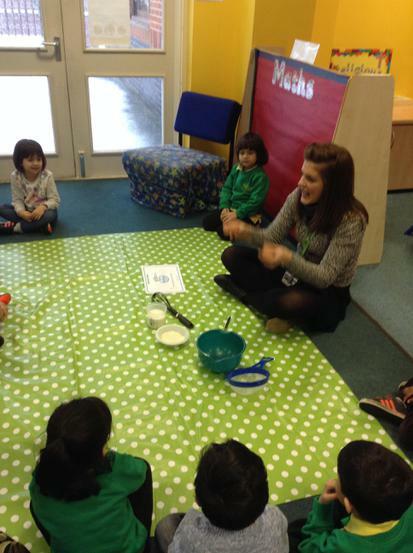 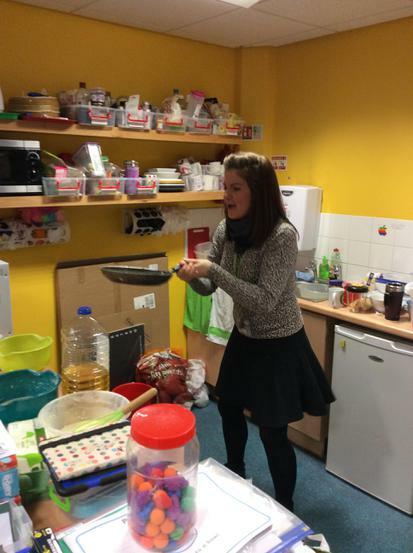 We are also lucky to have , Miss Raiza, Miss Koser and Miss Wilkinson working alongside the children full time. 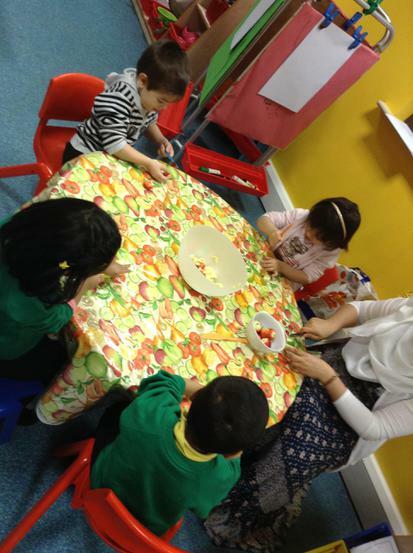 The children are grouped into Key person groups. 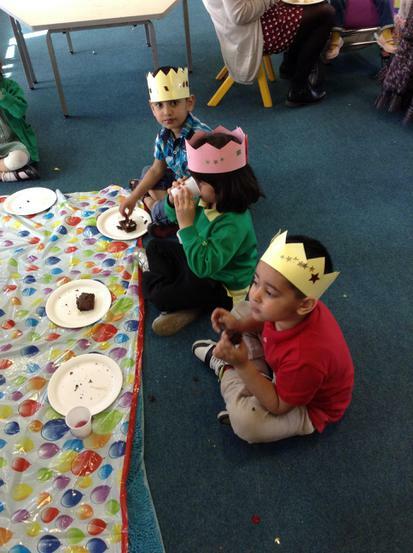 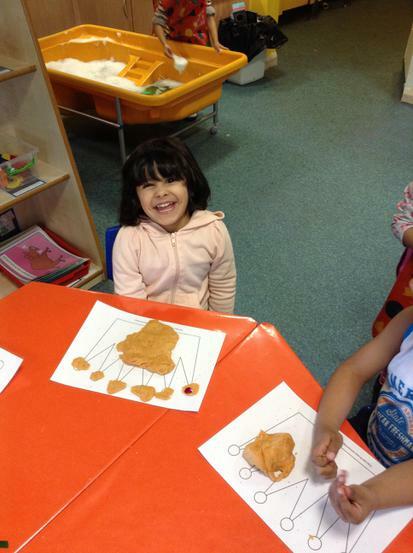 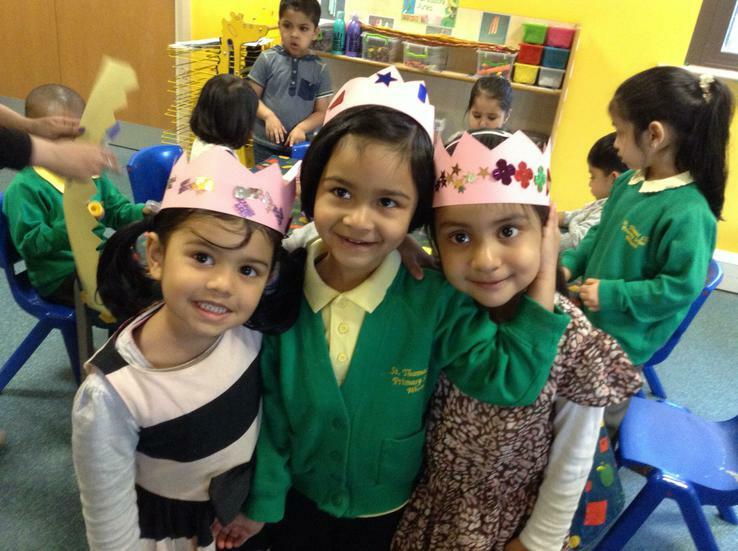 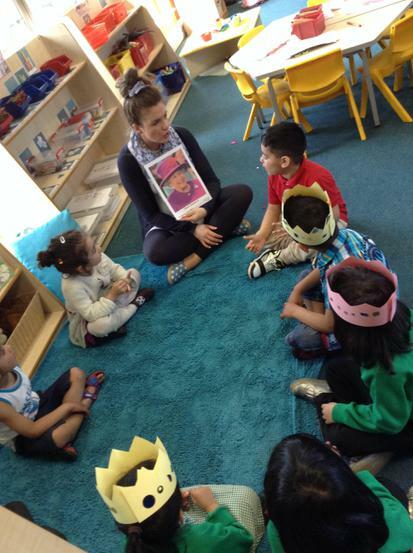 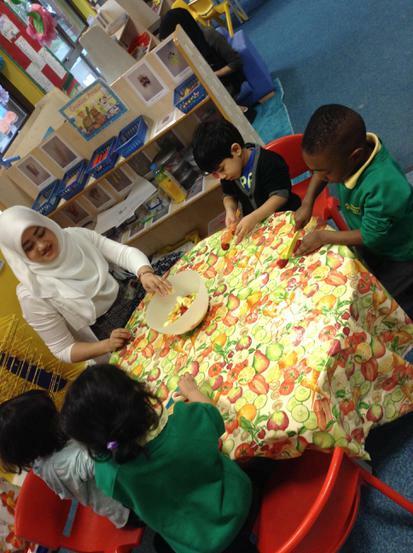 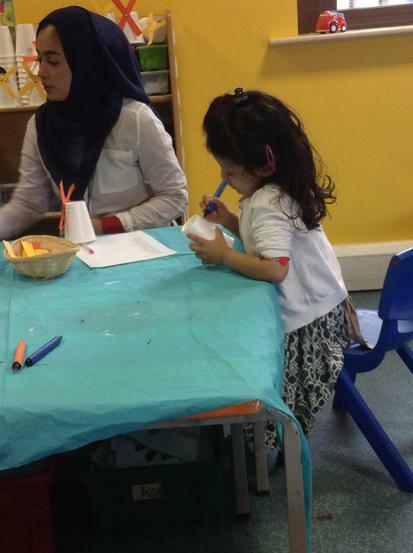 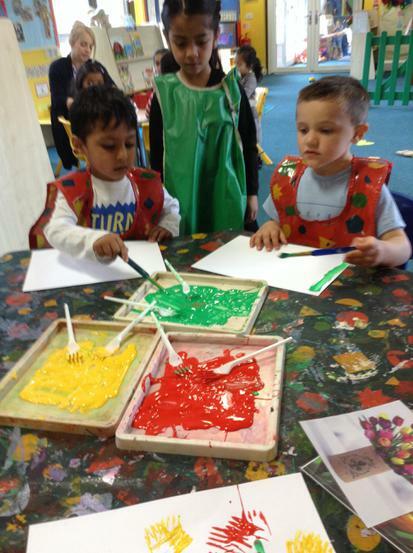 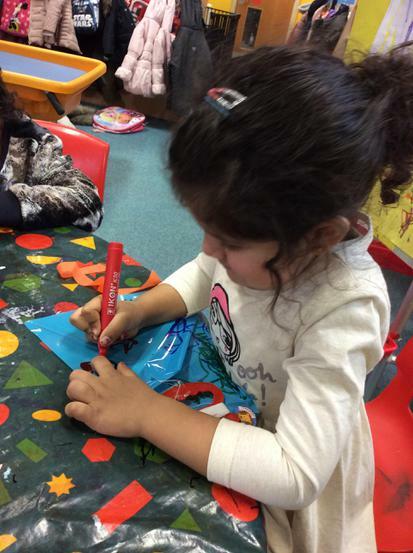 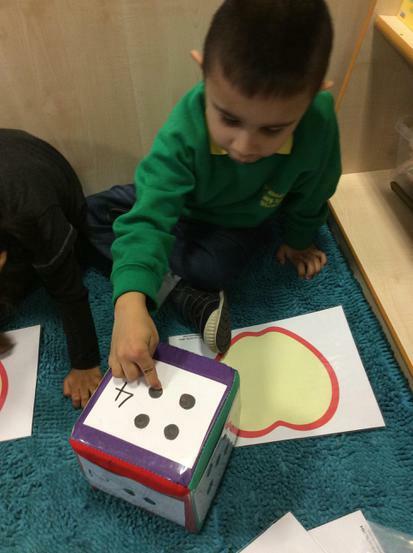 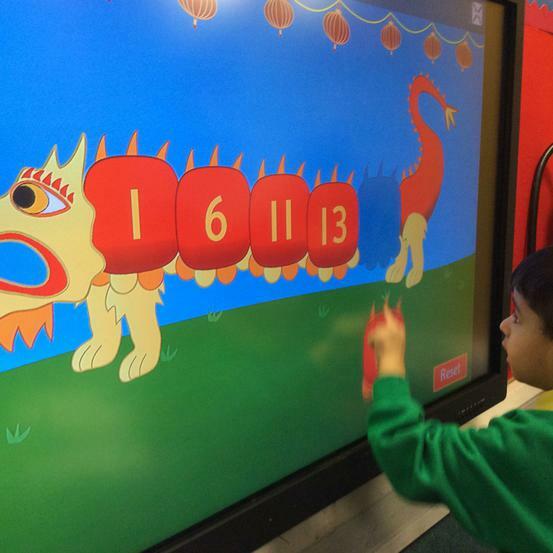 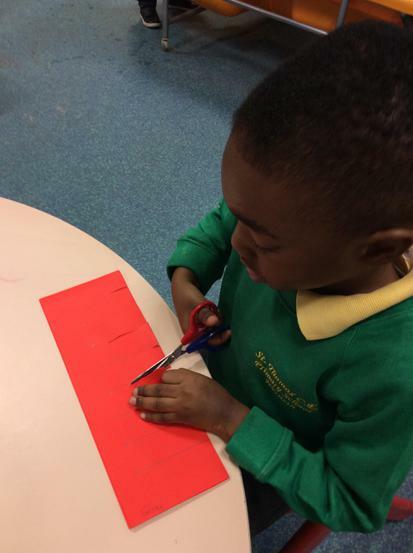 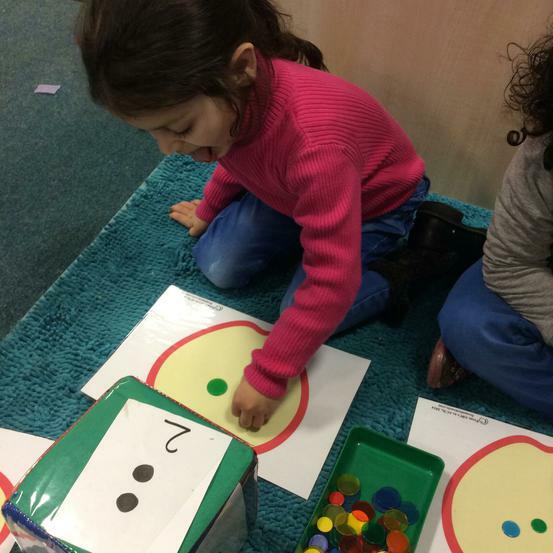 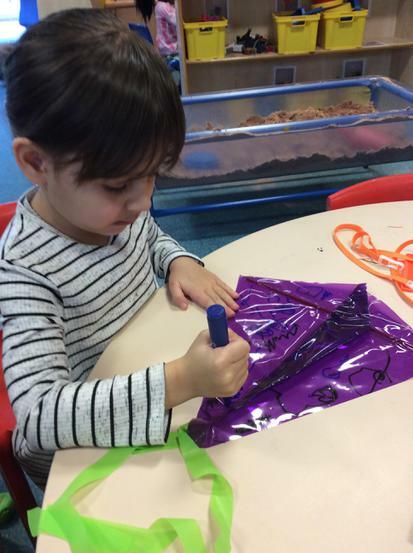 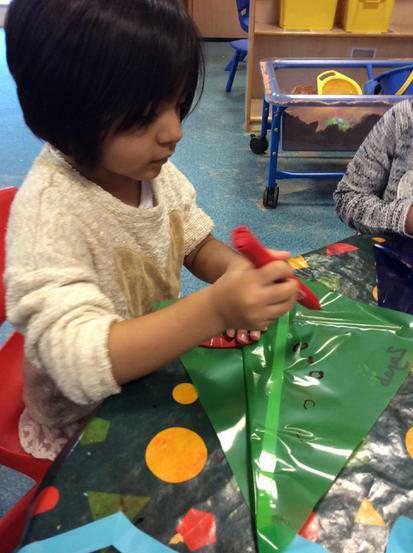 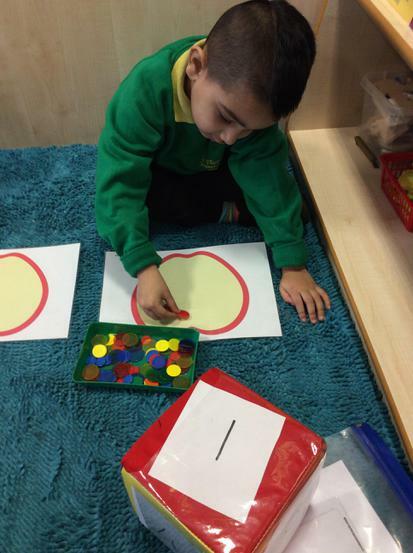 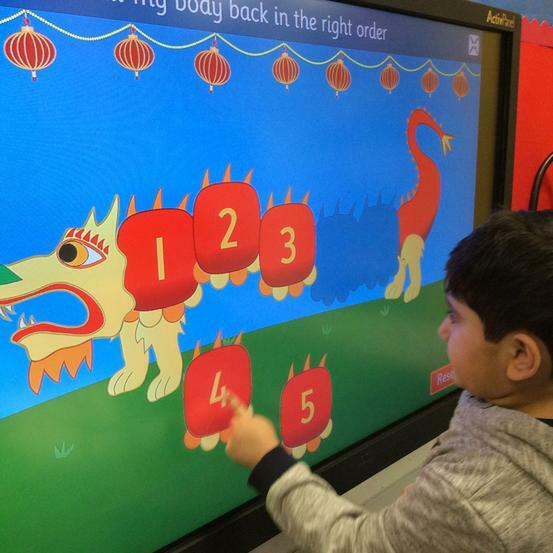 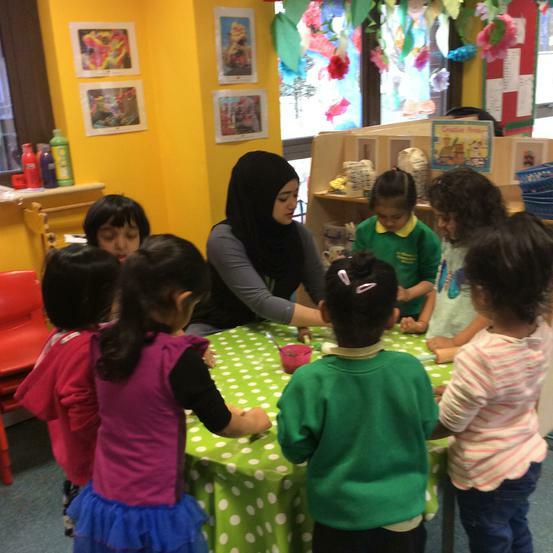 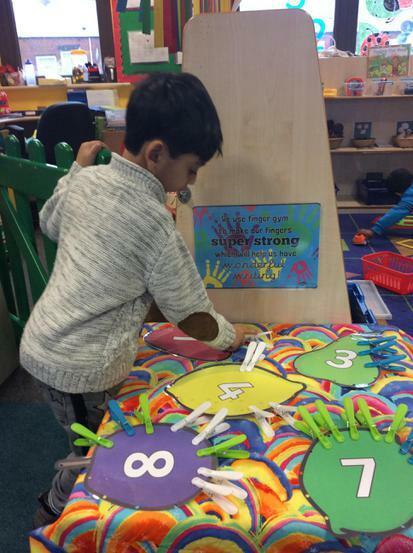 Daily activities are undertaken in these groups and are taught by both the teacher and the teaching assistants. 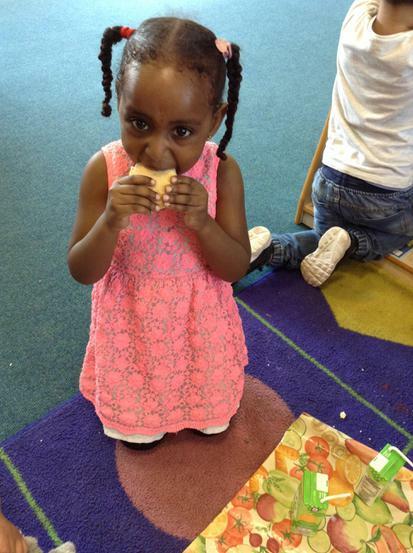 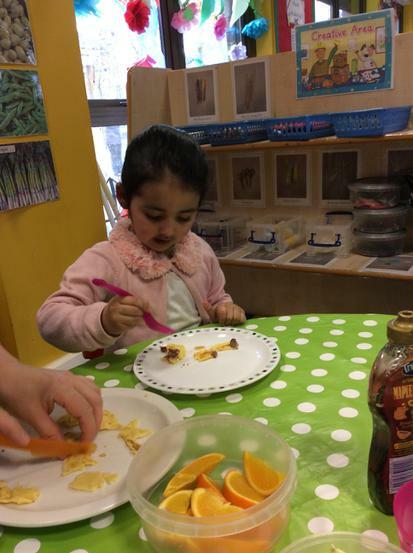 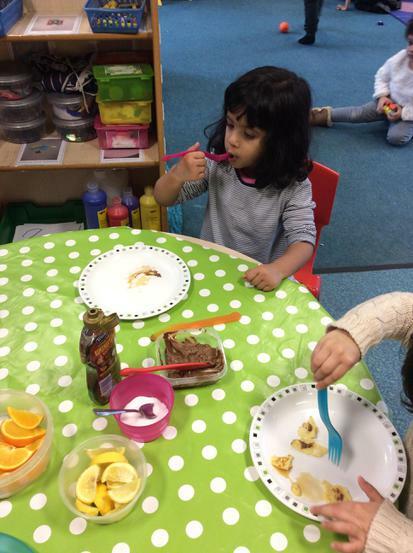 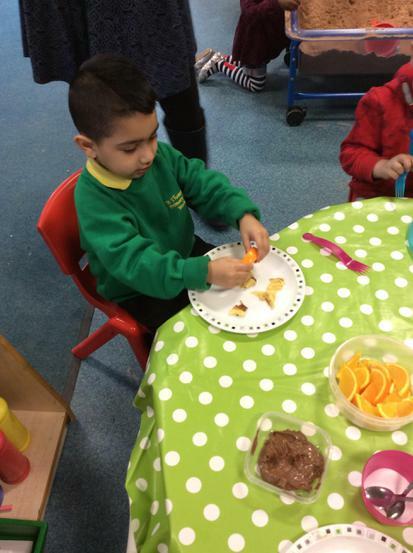 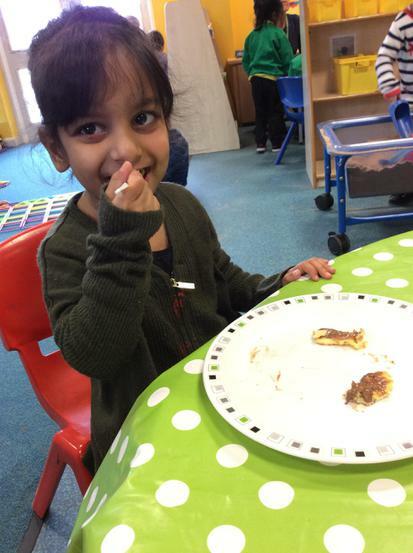 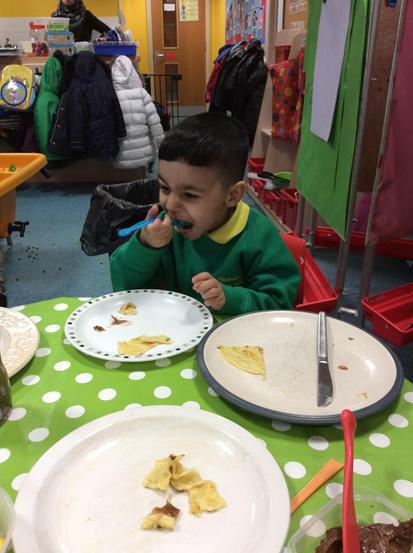 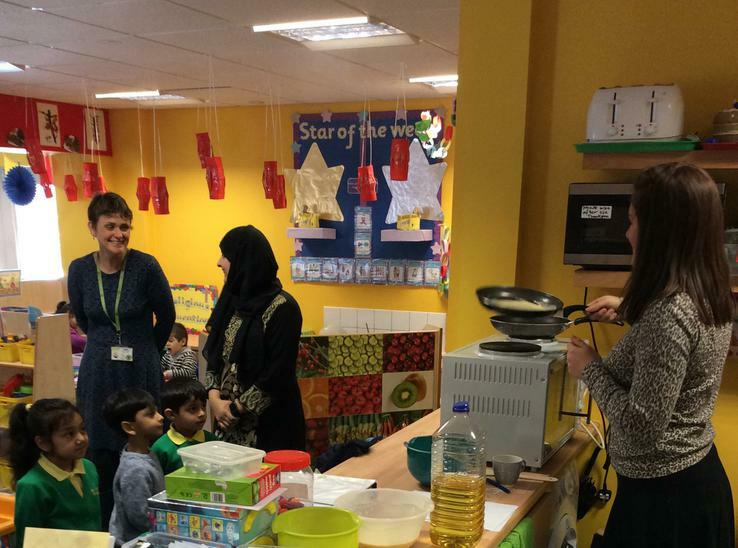 We have a snack table where the children can independently choose various healthy foods and drink including, crackers, bread sticks, cucumber and carrot sticks, a range of fruit, a selection of dips and toast. 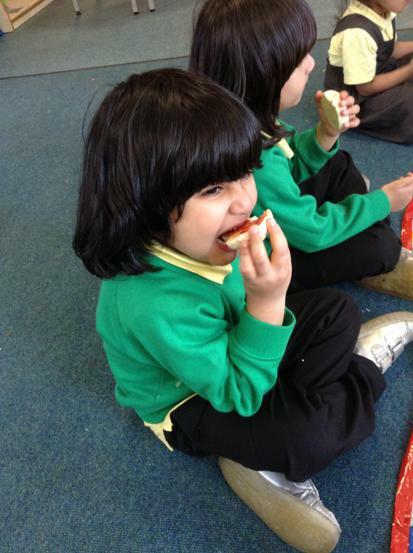 We ask parents/carers to kindly contribute £2.50 per half term to go towards buying the snacks. 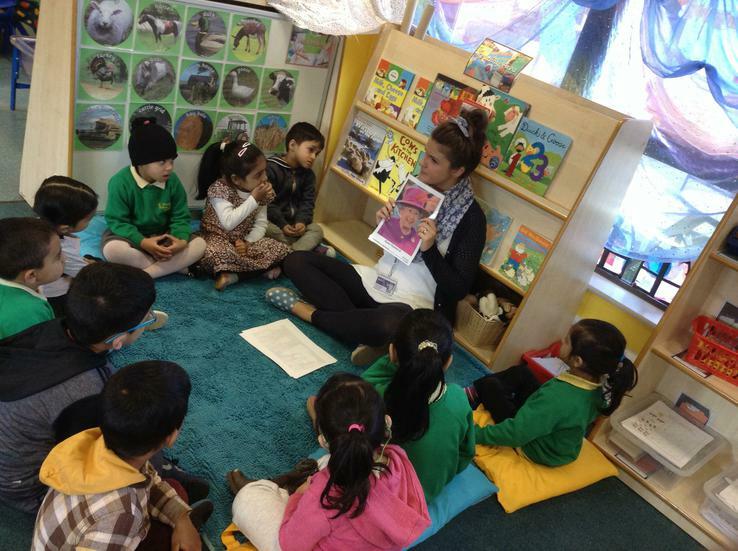 The children visit the school library every Friday where they will choose a book that they would like to take home. 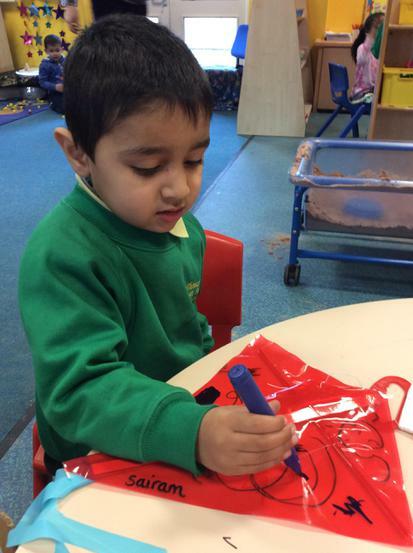 Could parents/carers please ensure your child brings their book bag every Friday. 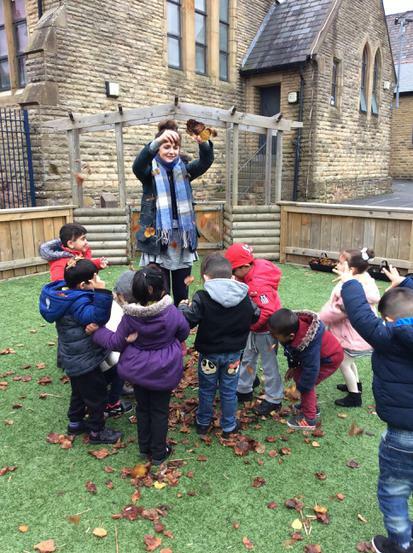 The topic this half term is all about 'Ourselves'. 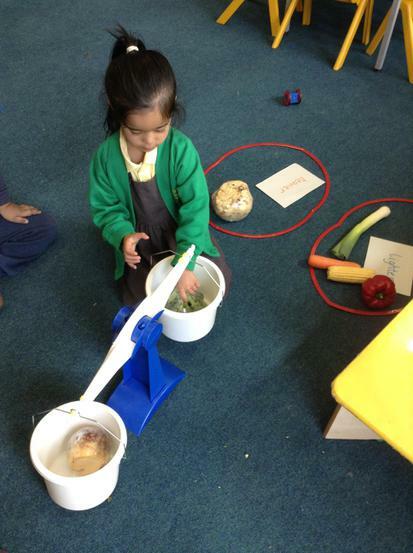 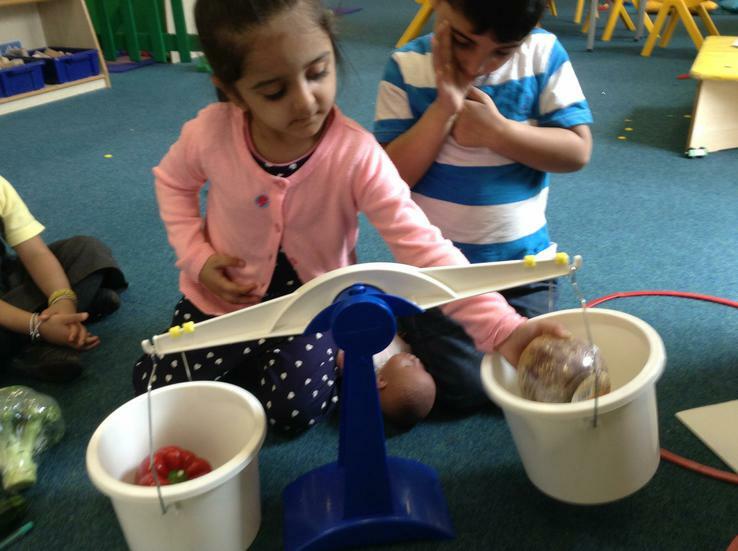 We will learn about our likes and dislikes, our body and how we use them, keeping healthy and our senses. 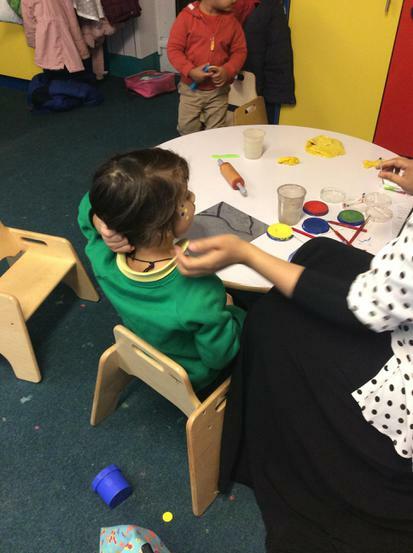 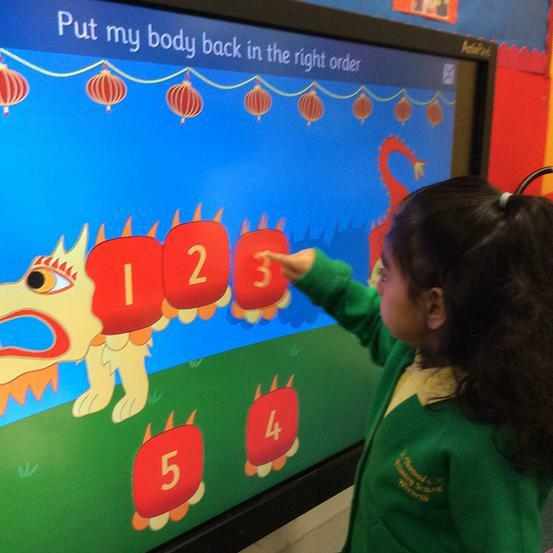 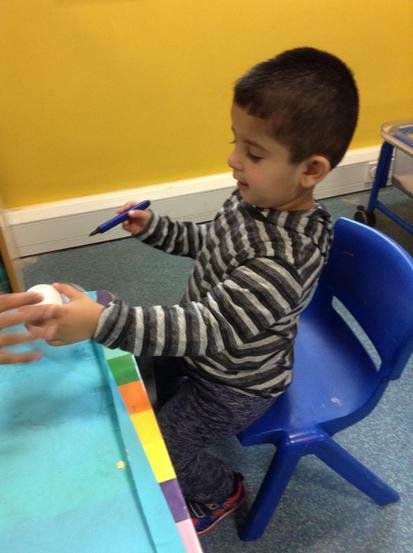 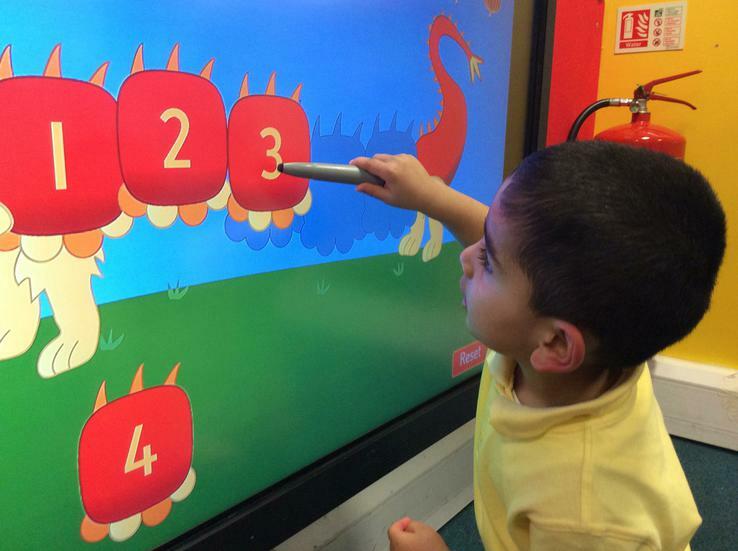 Children take part in a daily phonics session which concentrates on developing children's speaking and listening skills. 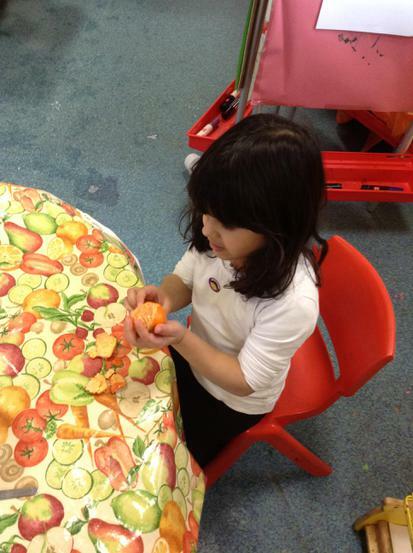 Our first RE topic is :Me, others and the world around me. 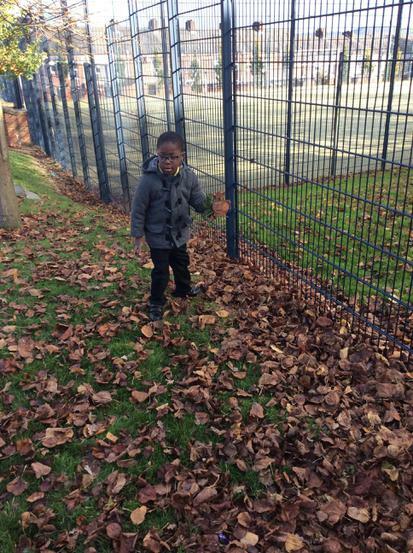 PE will be on a Monday for both morning and afternoon sessions. 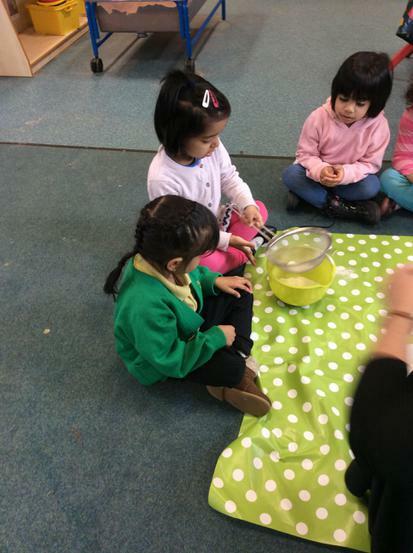 Theses sessions are carried out by Mr Farrell. 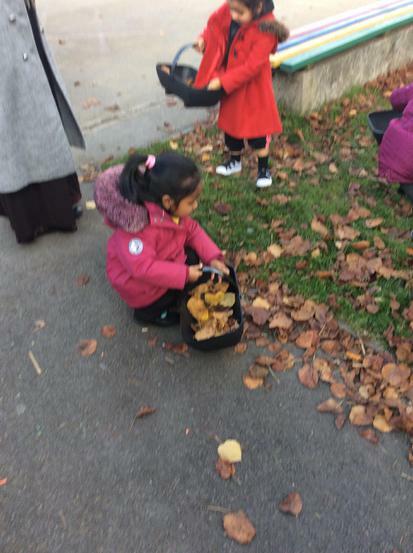 Nursery do not need a PE kit. 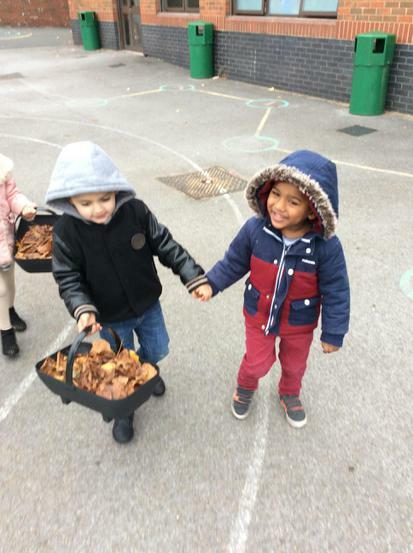 Children have access to the outdoors everyday and in all weathers. 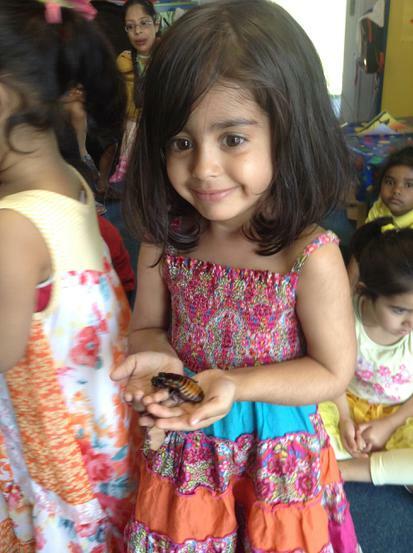 Please provide your child with appropriate clothing. 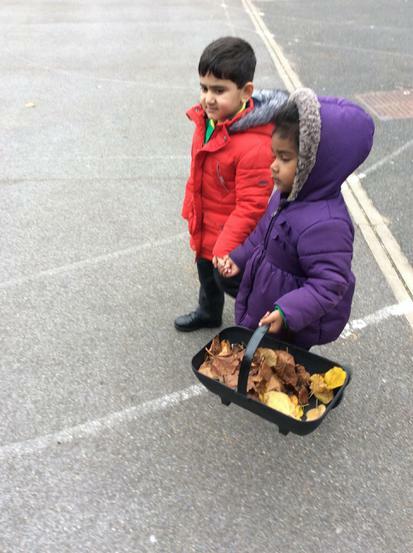 For example a warm coat, wellingtons, a hat, a scarf and pair of gloves.